Hi, I’m Amy! Also known to some as Alliekatmom. I am back with my second Recipe for you. 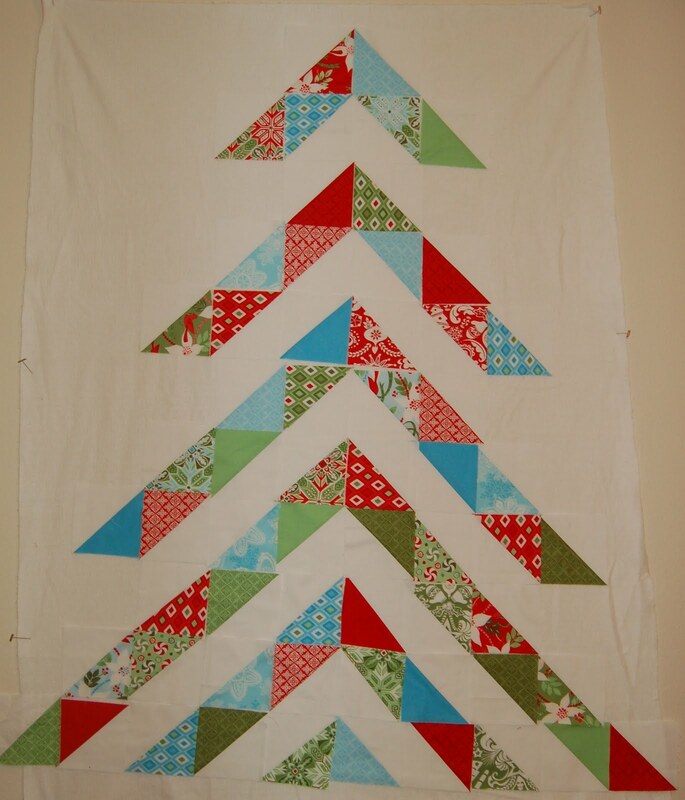 I I want to share with you this half square triangle (HST) Christmas Tree quilt, made with Kate Spain’s new line Flurry. This quilt is much easier to make than it looks. It goes together quickly and accurately. I hope you love it as much as I do. The first step is to choose 30 prints from your Flurry charm pack. I chose 10 from each color…trying to stay away from the ones with the white backgrounds so it would show up better against my solid background fabric. ** You may use more charms for more of a variety here. Then you need to cut your white backing fabric. Here are the cutting requirements. ** Borders are up to you! I added the borders by measuring both the top and bottom and dividing by two to get equal border lengths. They are 3.5″ wide. 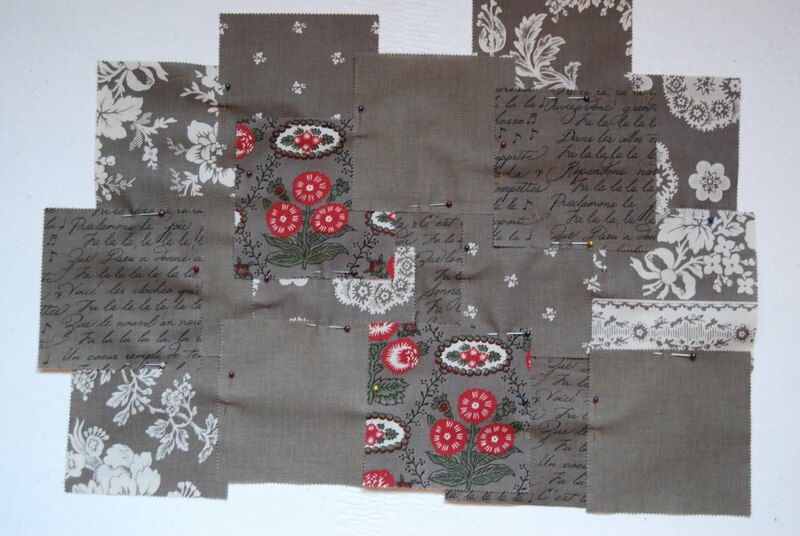 Sew the borders to the top and bottom and then measure the sides and divide by two….this will get you the side borders. If you have a 1/4 inch ruler, you may use it here and follow this technique for your HST’s. 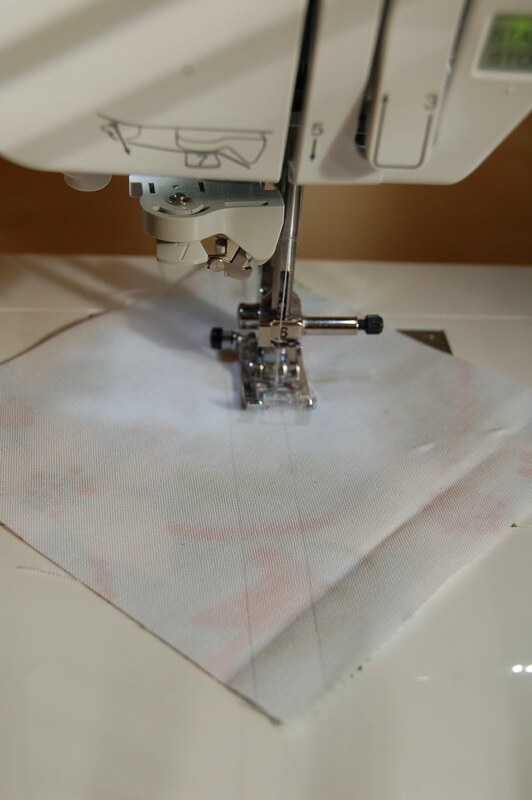 If not just draw a line down the center of your square (diagonally) and sew 1/4 inch on either side of that line. 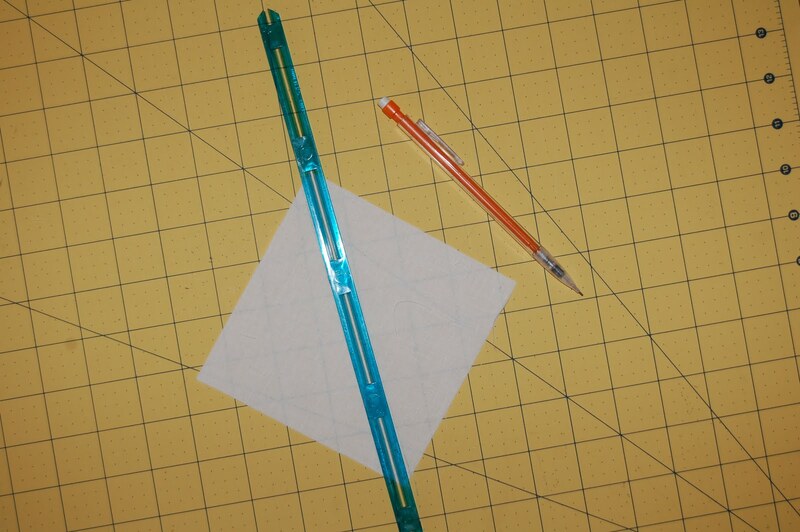 With your 1/4 ruler, draw a line on either side with a pencil. Do this for all 30 squares. When finished with the lines put the fabric front sides together, keeping the pencil lines facing out and on top. Sew down both sides of each HST. I suggest chain piecing (keep feeding the HTS’s in and do one side then with them all still attached to each other, do the other side). When finished sewing both sides of the HST’s, cut them in half…diagonally down the middle. 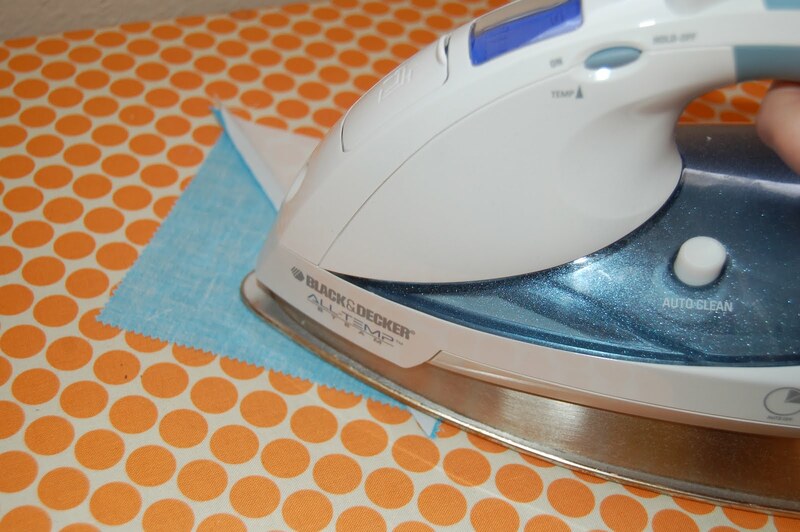 Then iron them open, pressing seams away from the solid white background. Trim each of your HST’s to 4.5 inches. 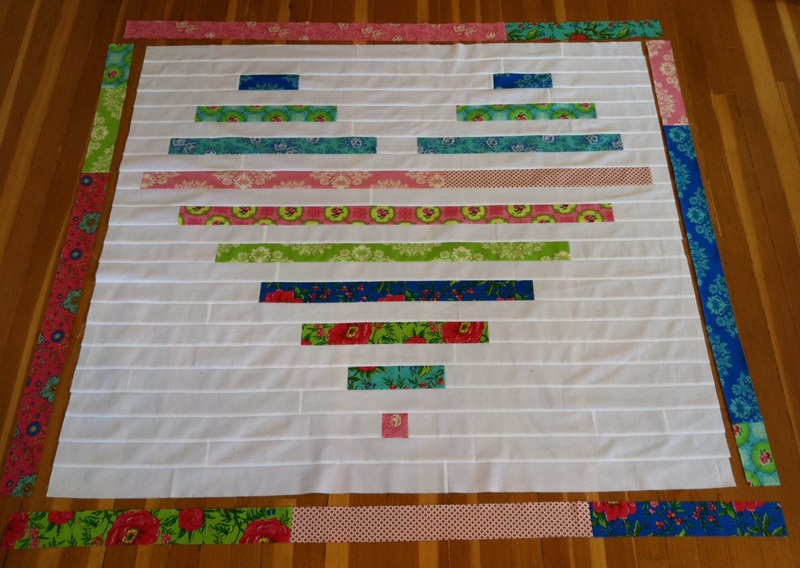 ** If you wish to make a smaller quilt, or a wall hanging then you can make your HST’s as small as you want by either making them smaller here or starting with smaller squares and then squaring them up to the nearest half inch. 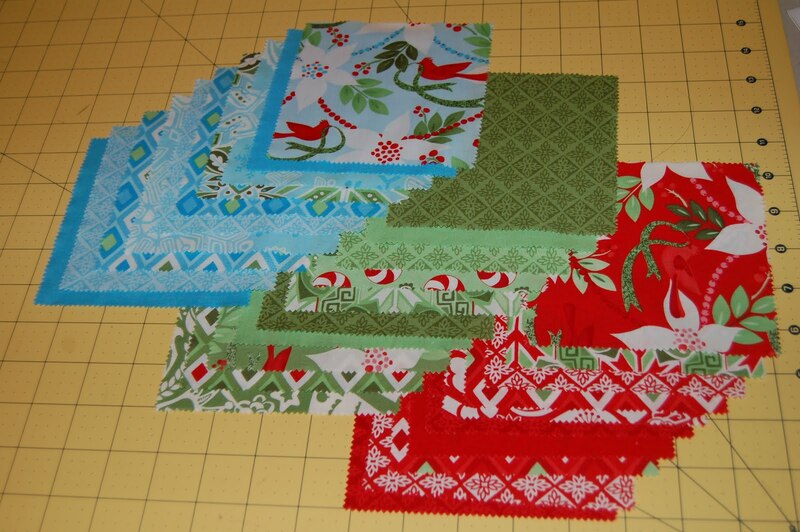 Once all your HST’s are trimmed to 4.5″ squares….You can begin assembly of the top. First lay out the HST’s in rows as it shows above. Take time to get the layout and placement you like best. Begin sewing your rows together. 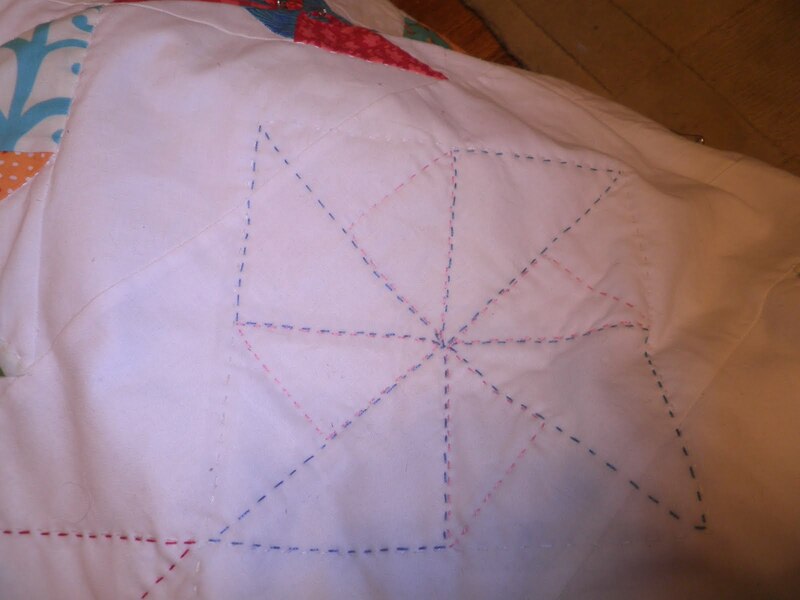 Start by sewing the top 4 rows together, pressing your seams so that each row of seams are going in opposite directions. For example, in the top row your seams will all be pressed in the left direction, the second row all the seams will be pressed towards the right. This will make piecing the rows easier. Or if you prefer, you may press your seams open. Next sew the 4 rows you just pieced together. 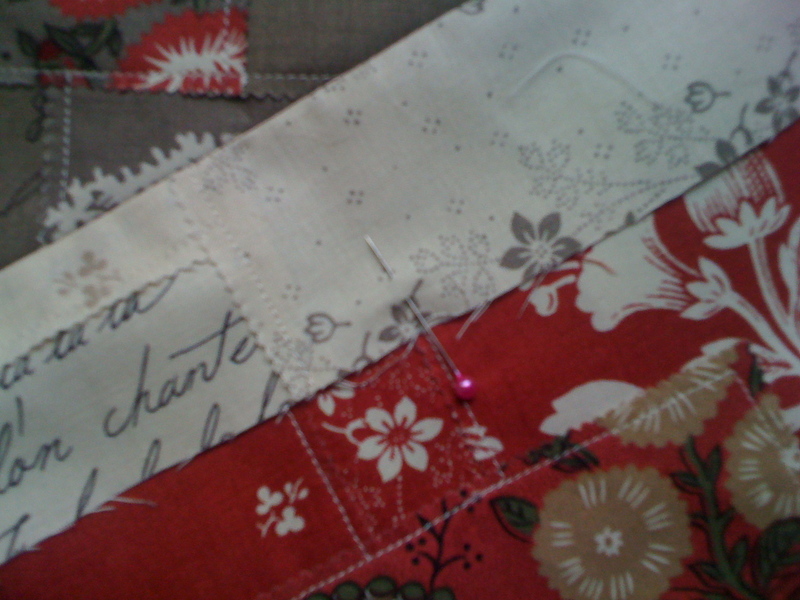 Match up each seam and pin before sewing together. I like to pin them this way so that my needle doesn’t get in the way while I am sewing. It works just as well as pinning the other way. Pinning is important if you want your points to match up. ** Tip: In the picture above you can see where my sewing lines meet and make an X, this shows you where to sew and where you 1/4 inch is. 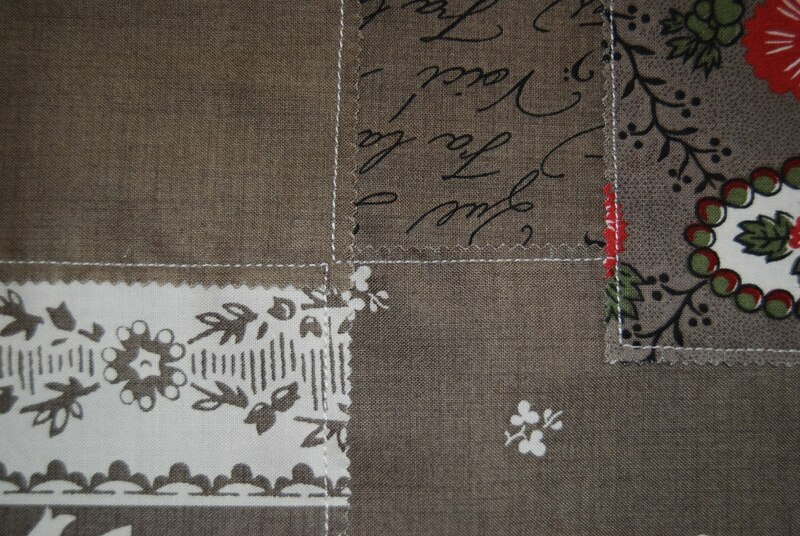 As you are sewing, make sure you sew just on the outside edge where that X is, getting as close as you can to the X. This will give you perfect points. Finish sewing your 4 rows together. 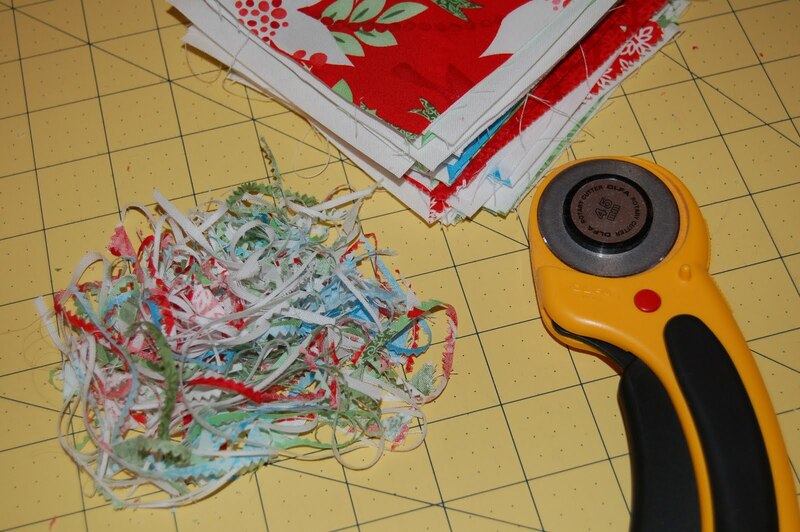 Sew the 16.5″ x 4.5″ strips to each side of the row. Sew the next three rows together following the same procedure as the first 4 rows. 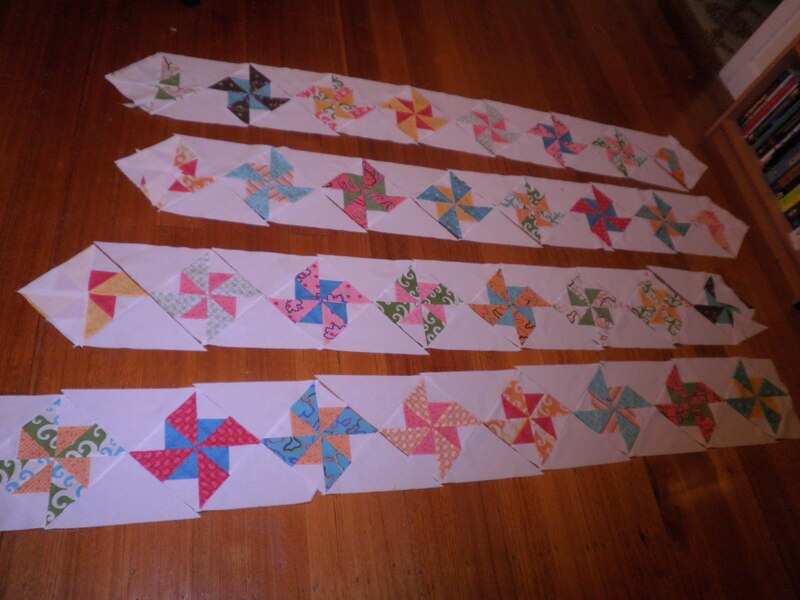 Sew the 29″ x 4.5″ strips to each side and then attach these rows to the top 4 rows. Sew the next three rows together and attach them to the top completed rows. 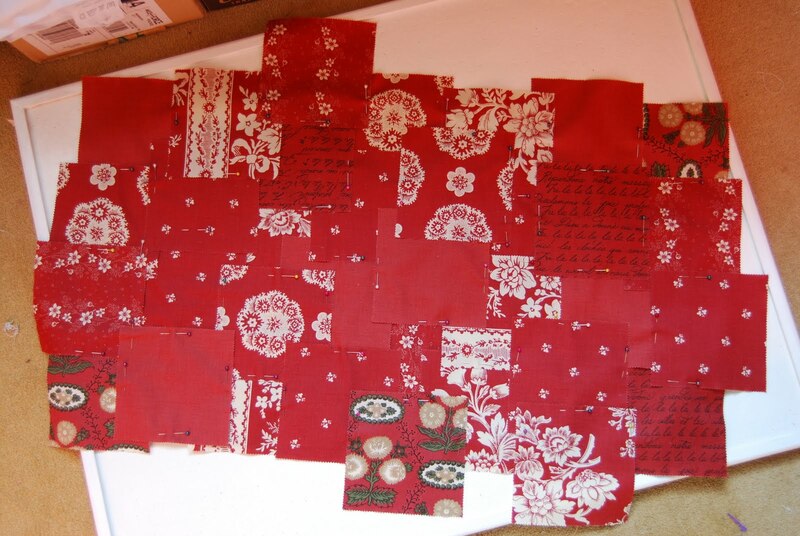 Then you will sew the 41″ x 4.5″ strips to each side. You have one more row (the bottom row) to sew and attach to the completed rows. This completes the tree part. Next you will make the wonky star for the top of your Christmas tree. 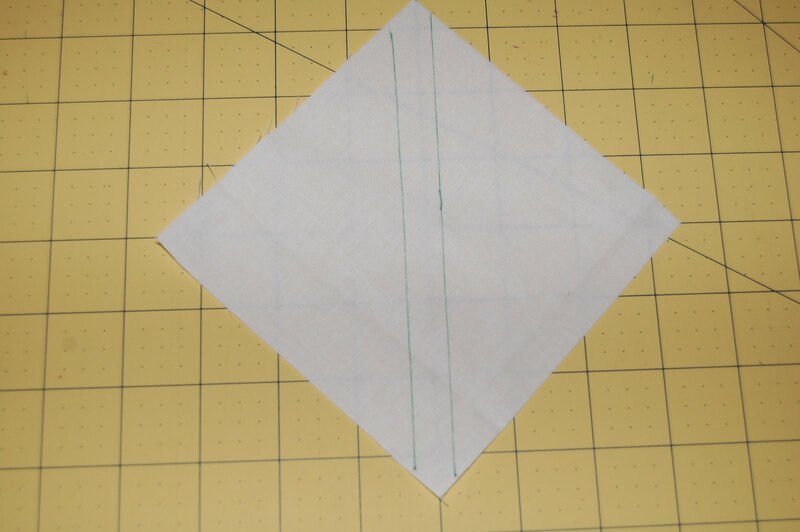 Take your 2.5″ white square and put your printed triangle as shown above (you can make it as wonky as you want, just be sure that when you fold it over it will cover the white part of the square completely) and sew a 1/4″ seam on the diagonal line. Press and trim away the excess. 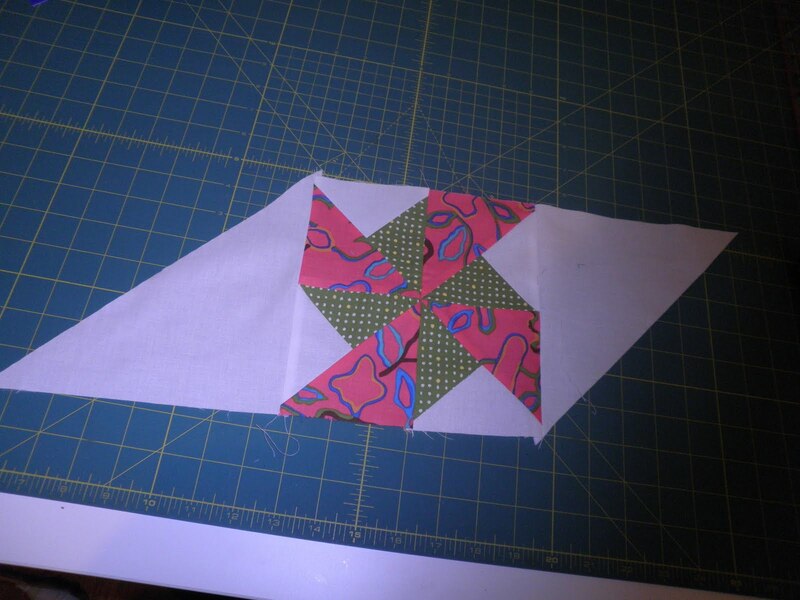 Lay your second triangle over the one you just sewed. and sew your 1/4″ seam. Press and trim the square to 2.5″. Follow these steps 3 more times. 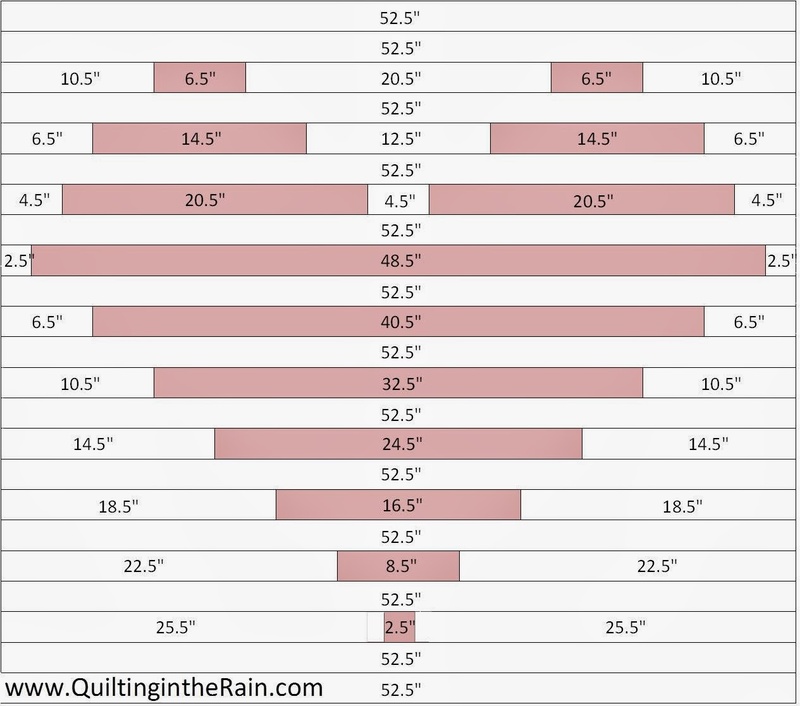 Layout all of your 2.5 inch squares like the picture above. You will have one center block, 4 corner blocks of white, and 4 star point blocks. Sew these together as you normally would. 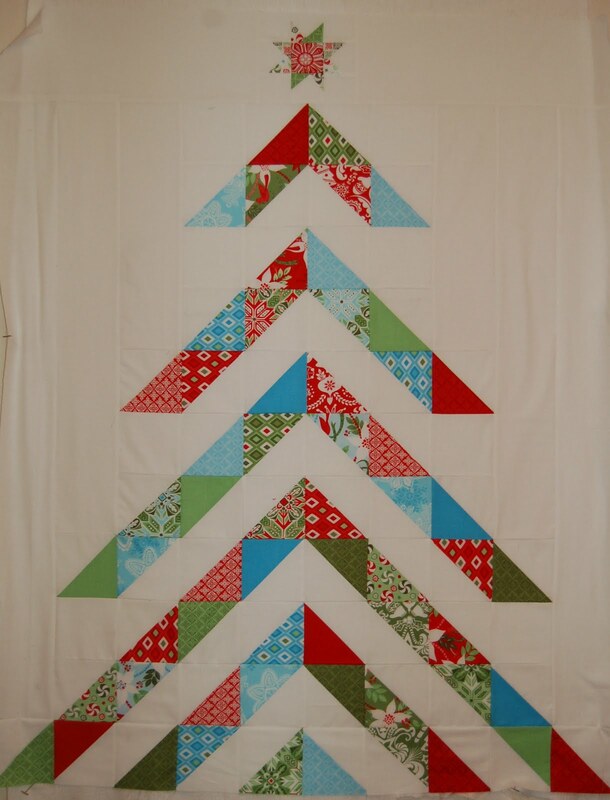 Attach the 17.75″ x 6.5″ strips to each side…centering on the top of the quilt attach it to your Christmas tree. And your top is finished. 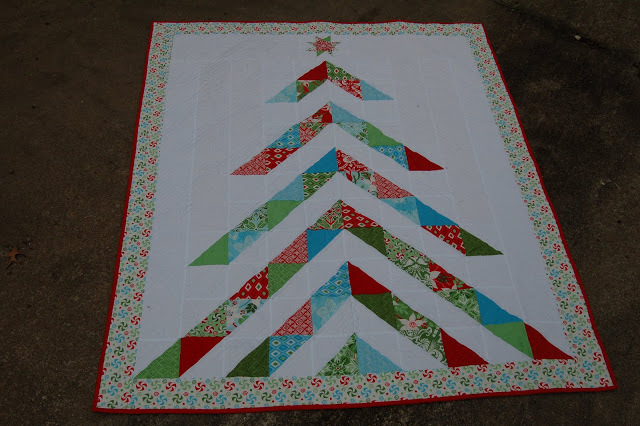 I added 3.5″ inch borders to the quilt, quilted with straight line quilting…echoing the HST’s and only quilted in the white areas to make the tree stand out more. Back and bind as you normally would. I hope you have enjoyed my tutorial and don’t forget to stop by and tell me what you think on my blog. 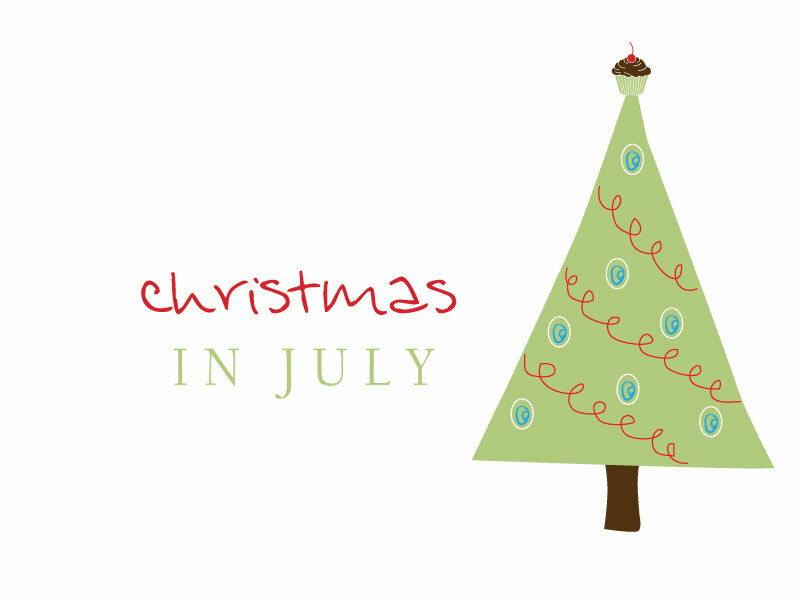 Escape the summer heat and daydream about Christmas with us! The Bake Shop chefs have been cooking up some yummy holiday recipes to share with you throughout July. All of these treats are calorie free, so dig in … guilt free, of course! 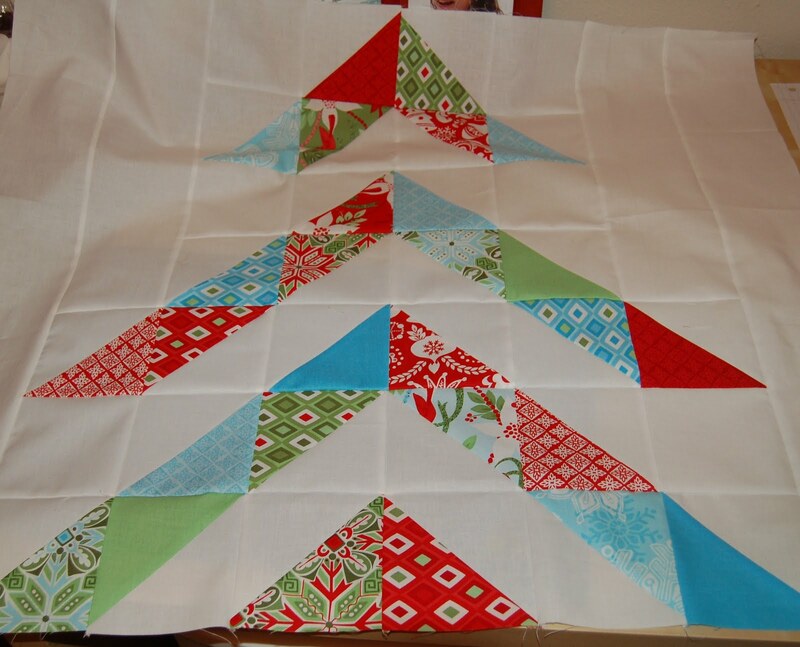 Check back tomorrow for Amy’s modern Christmas Tree quilt. 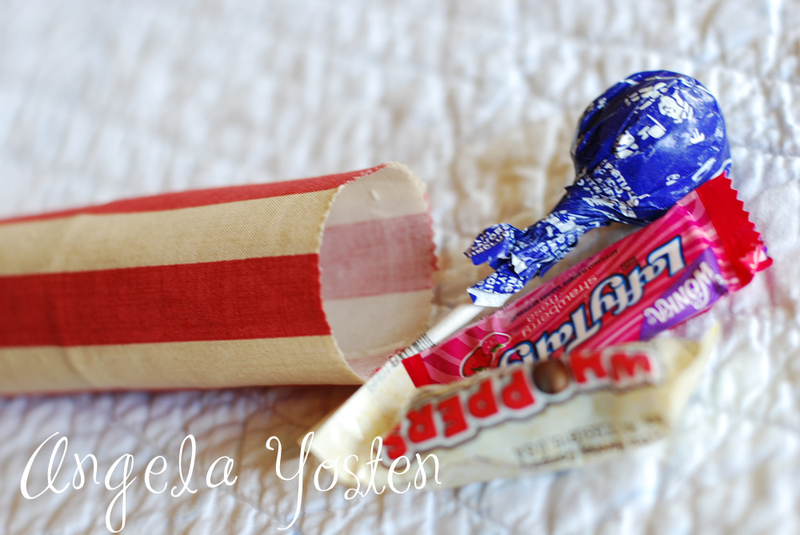 July 4th is just around the corner and to help celebrate our independence, I have made up these quick and easy Firecracker Treats that are sure to put a smile on any kid, young or old. This is a great project to get your kids involved in and recycle all those empty toilet paper rolls and leftover layer cake squares. Be sure to check out all my other Free Tutorials here. 1. Gather all your ingredients together… you will need one layer cake square (10″ square) for each toilet paper roll. 2. Place 1 square wrong side up and place a toilet paper roll centered towards one end on its side. 3. 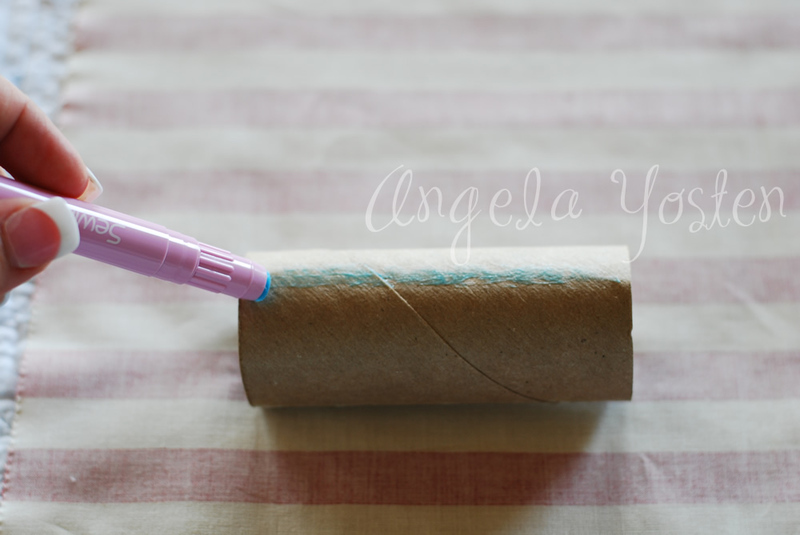 Using your Sewline glue pen, apply some glue across the toilet paper roll. 4. 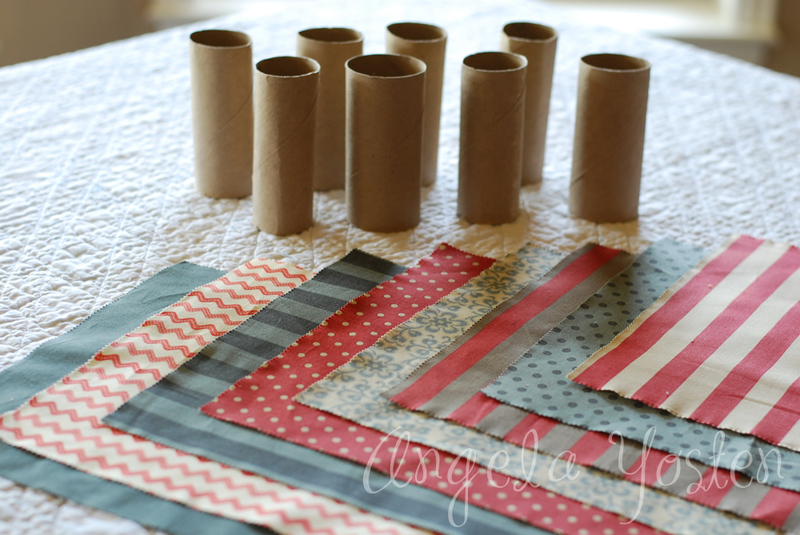 Start rolling your fabric around the toilet paper roll. 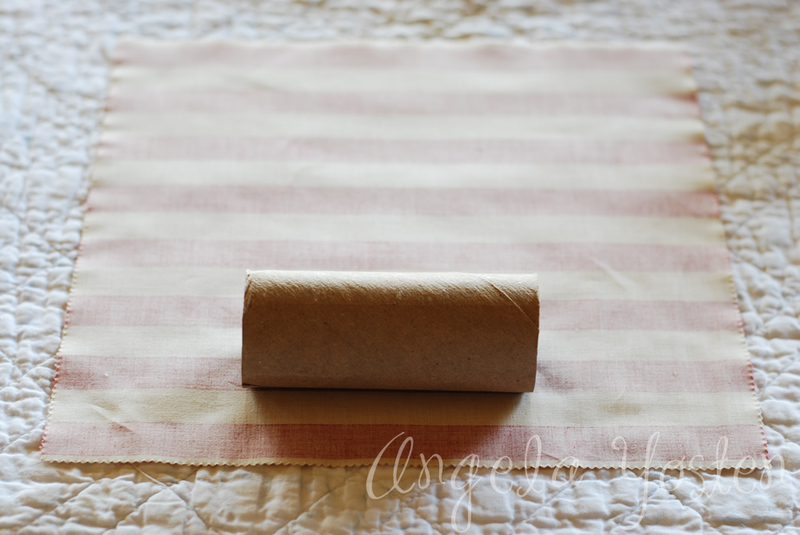 Continue to apply glue around the roll on the fabric until your fabric is completely rolled around the toilet paper roll. I overlapped my fabric to use the whole square. I did not cut anything off the square. 5. 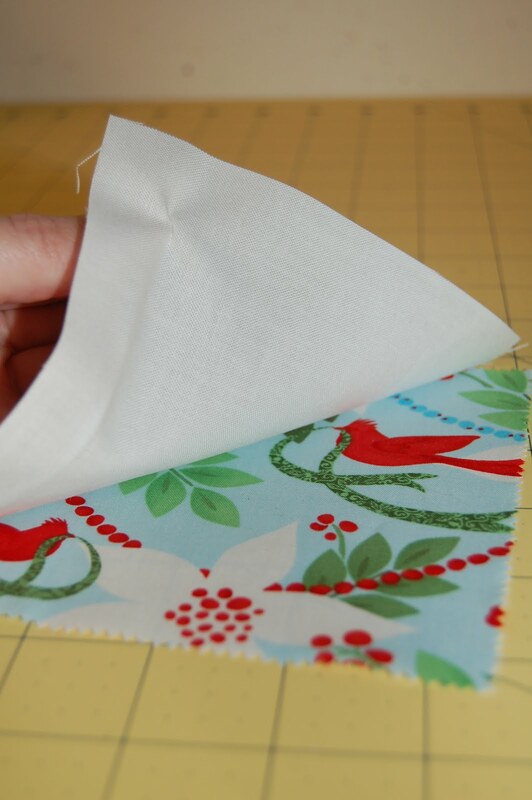 Seal off the end of the fabric to the roll using the glue stick and press firmly to make sure your fabric is stuck. 6. Using some decorative trim or ribbon, cut off approx. 6 inches to tie around each end. 7. Tie off one end of your firecracker to seal it. 8. 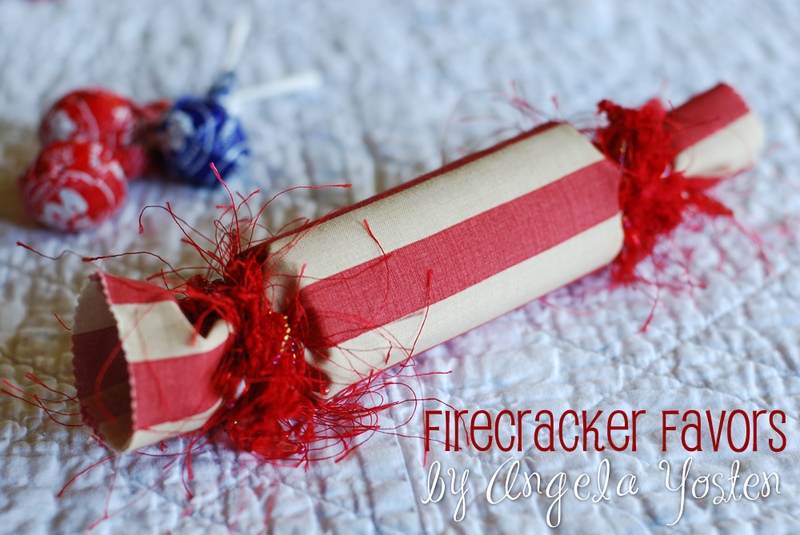 Fill your firecracker favor with special treats or candy for that special person. 9. 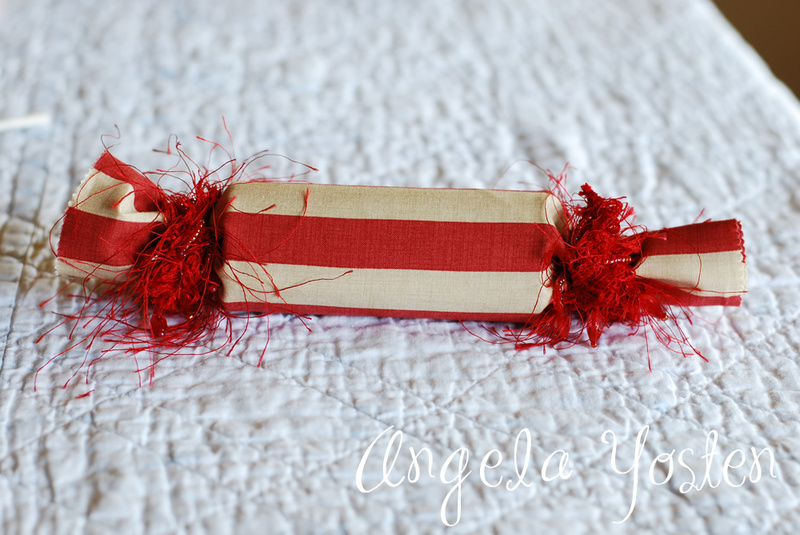 Using another piece of decorative trim or ribbon, tie off the other end of your favor. 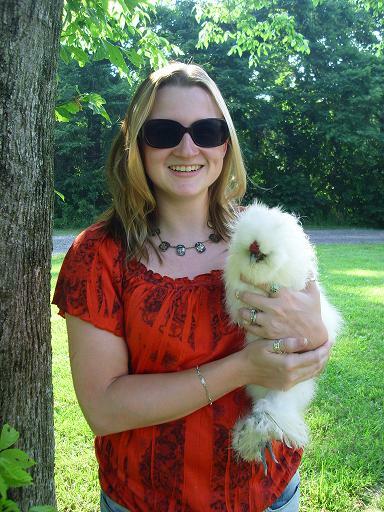 Hi, I’m Kristy and I blog over at HandmadeRetro. This is my first Moda Bake Shop recipe and I couldn’t be more excited to share this little quilt I came up with. 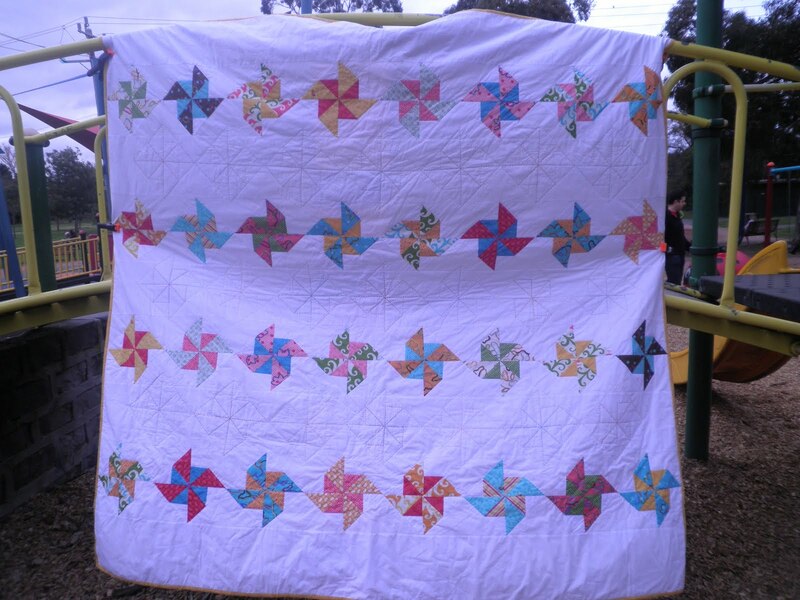 When I was designing this quilt I was jointly inspired by the wind farms outside of Canberra in the Australian Capital Territory and the back of a wedding quilt I made for my brother and his wife which was in turn inspired by the aisle markers at their outdoor wedding. I was so please when I came up with the technique (that may or may not be original) that I thought it deserved a quilt of it’s own. So here it is, Pinwheels on the Plain. Sort the layer cake into two piles: one for the larger triangles and one for the smaller inner triangles. 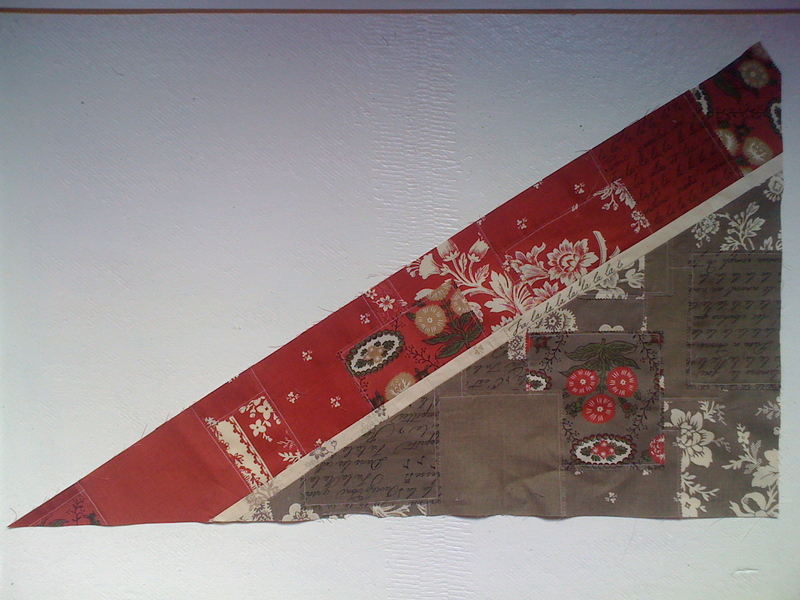 Because paper pinwheels created by cutting and folding scrapbooking paper inspire the quilt, I chose a small design for the smaller triangle, and a large design for the bigger triangle. I also tried to make the pairs different designs and colours. You will need 16 layer cake sheets for the larger triangles and 8 for the smaller triangles. 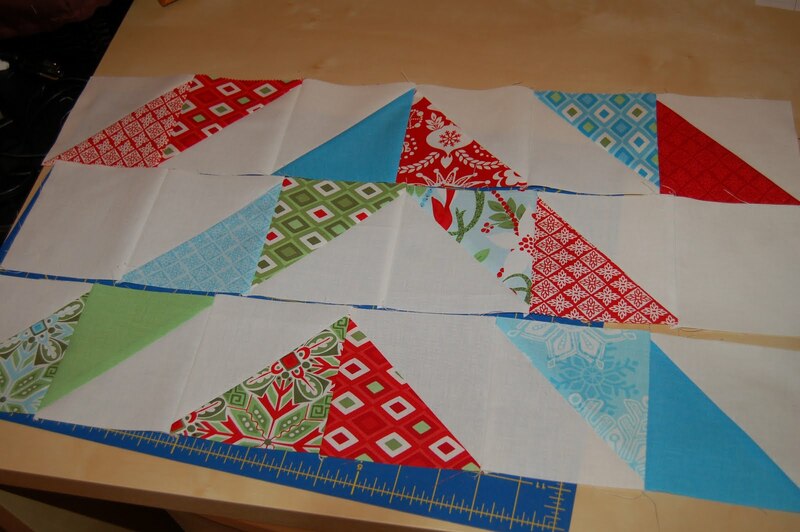 From the 16 layer cake sheets for the larger triangles, cut 4×4.5″ squares. 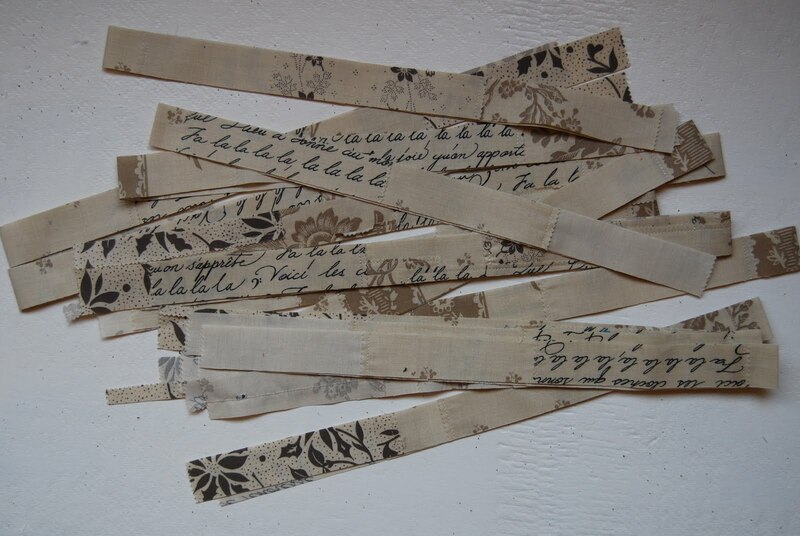 (5) 83″x9″ strips (I cut mine lengthways). 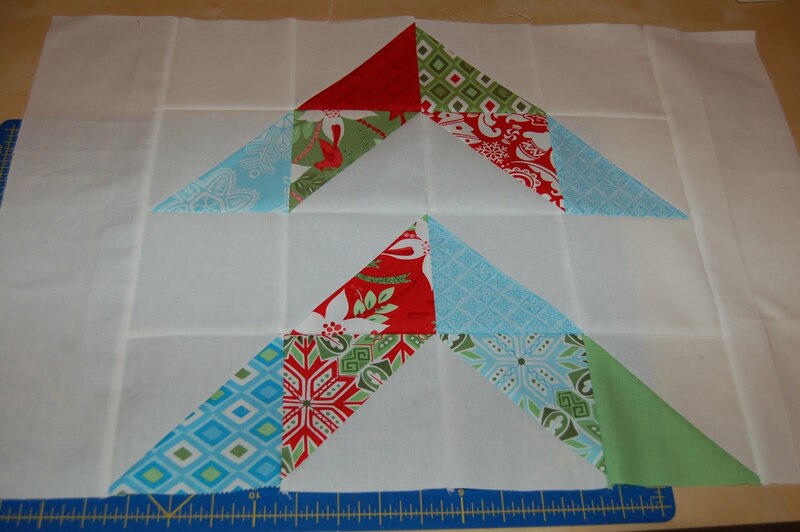 4 more 7.5″ squares and crosscut into 16 quarter square triangles. 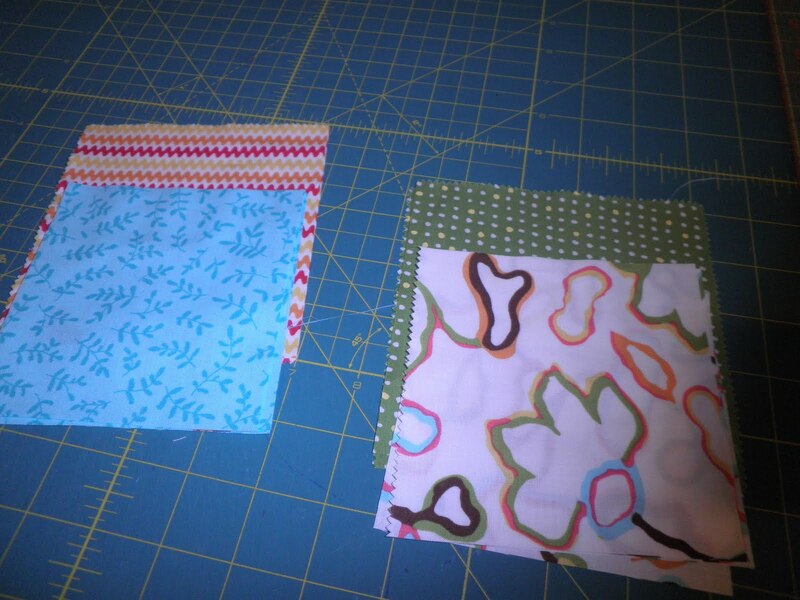 Start by sewing the solid charm squares to the 5″ print squares into HST units. – Sew .25″ either side of the line. – Cut along the drawn line. – Press HST units open, pressing seam to print. – Trim to 4.5″, making sure your diagonal seam remains in the centre of your pinned unit. You will have 8 HST units in each print. 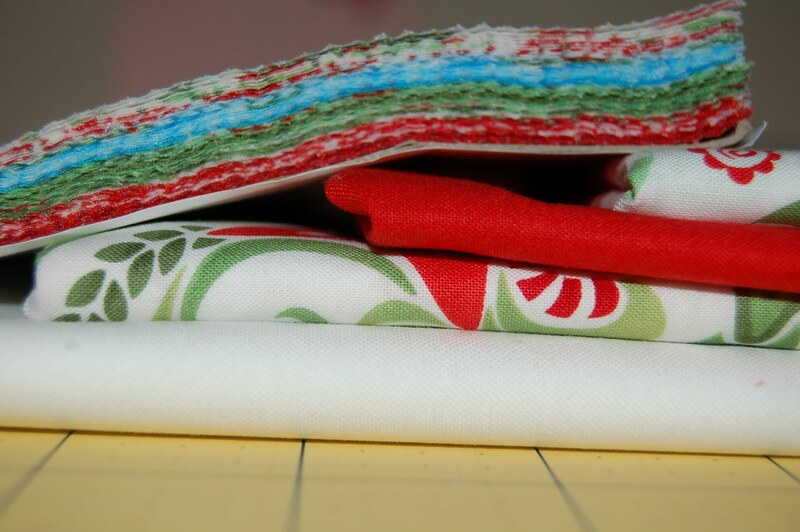 Sew HST units with the units you just made and the 4.5″ print squares. 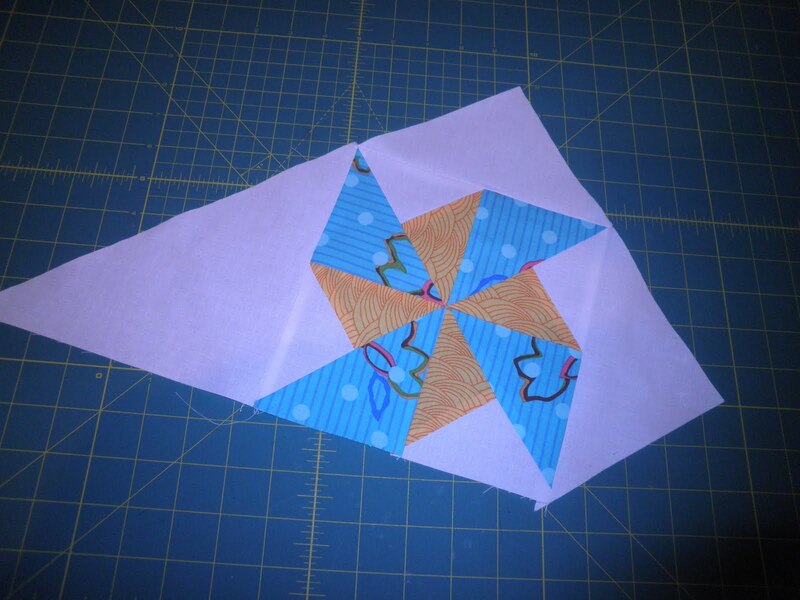 – Press HST units open, pressing seam to larger triangle. – Trim to 4″, making sure your diagonal seam remains in the centre of your pinned unit. 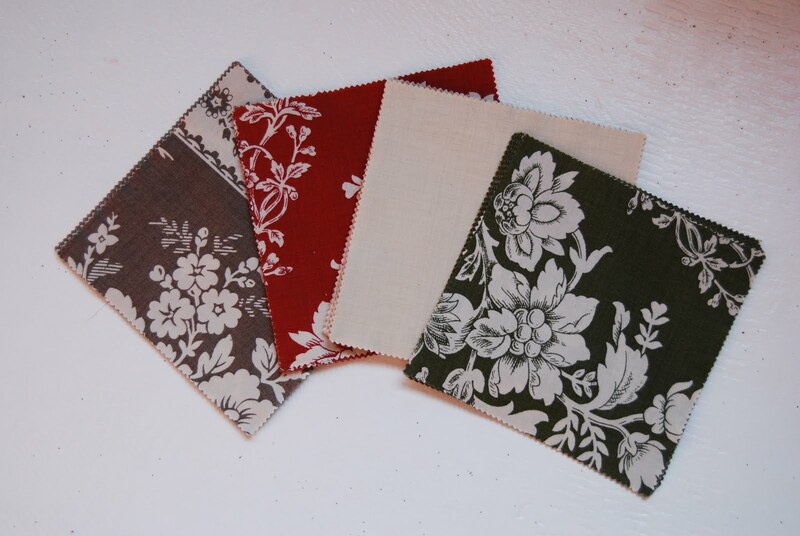 You will have 8 HST units in each print combination – four in one direction and 4 in the other. – Layout your 8 units in each colour combination into two pinwheel units – one will ‘turn’ in a clockwise direction and the other counterclockwise direction. 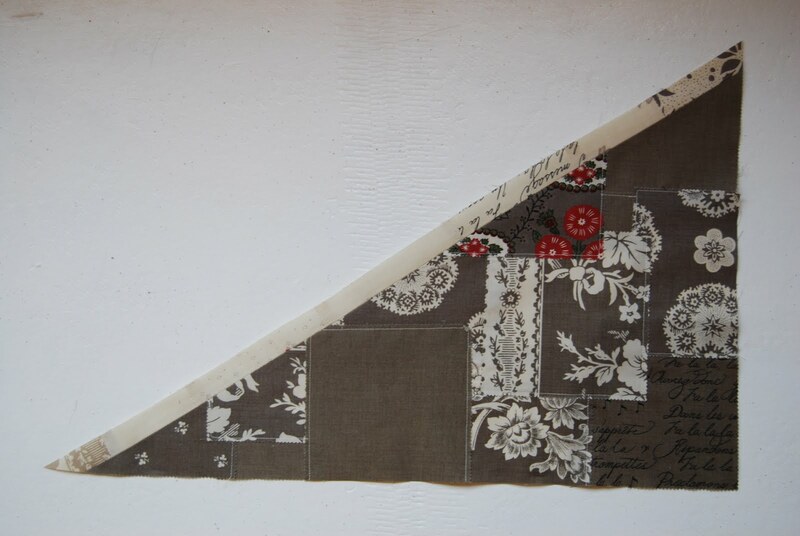 – Sew the vertical seams and press to the larger triangle. – Sew the horizontal seam. Make 32 pinwheel blocks, you will have 16 unique combinations. Lay your pinwheel blocks out on your design wall or floor in four rows of 8 on point, making sure you have a good spread of colours. Have alternate rows spinning clockwise and counterclockwise. 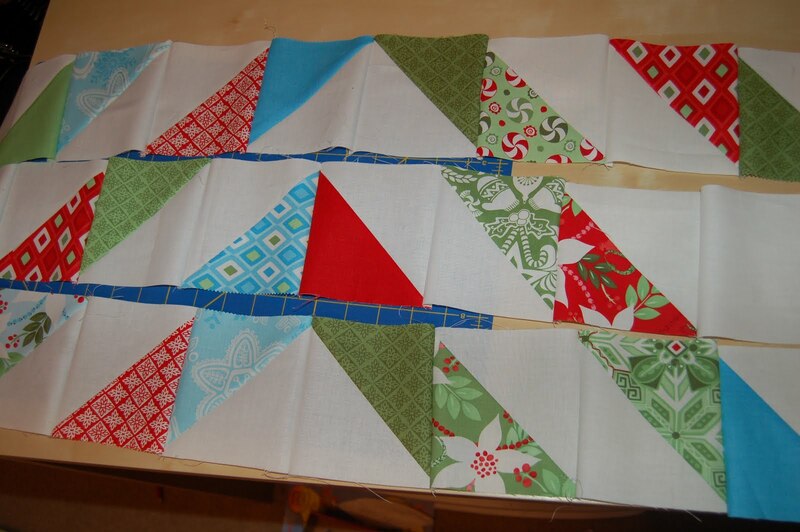 – Working one row at a time, sew a setting triangle to the bottom right of each block. It may overhang a little at the bottom edge, don’t worry. You won’t need to do this for the last block in each row. Press seams to the solid. 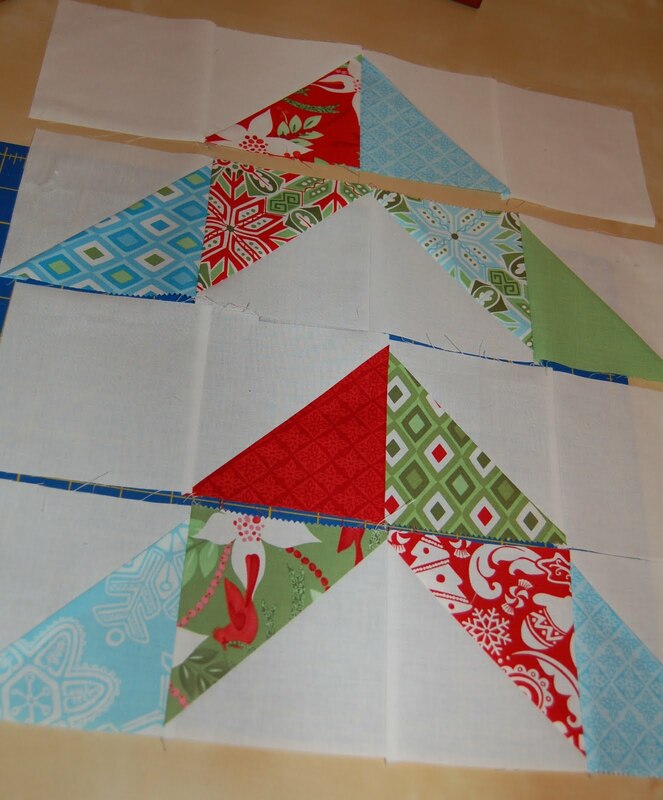 – Working one row at a time, sew a setting triangle to the top left of each block. Again it may overhang a little, this time at the top but don’t worry. This time you won’t need to do it for the first block in the row. Press seams to the solid. – You will end up with blocks that look a little like this. 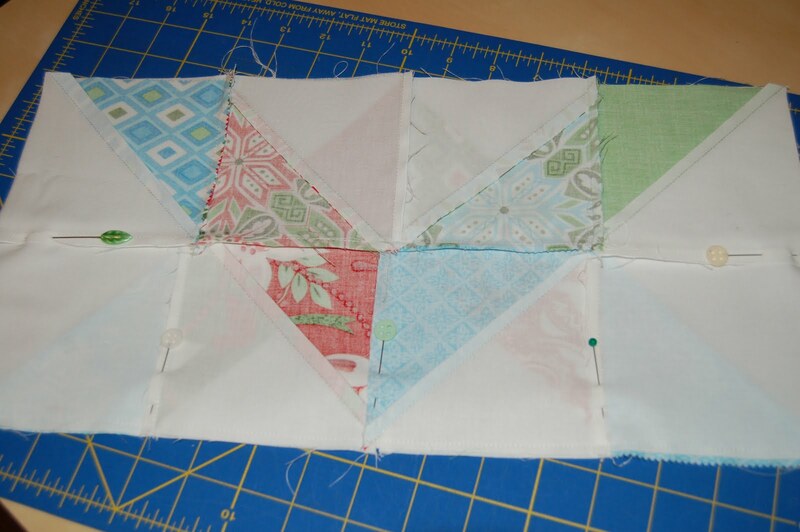 – Sew the quarter square triangle to both sides of the end blocks left exposed. – Trim any dog ears at the edges, ensure you leave .25″ seam allowance at the pinwheel points. – You have a row! Join a solid strip between each of the rows and one at the top and the bottom. 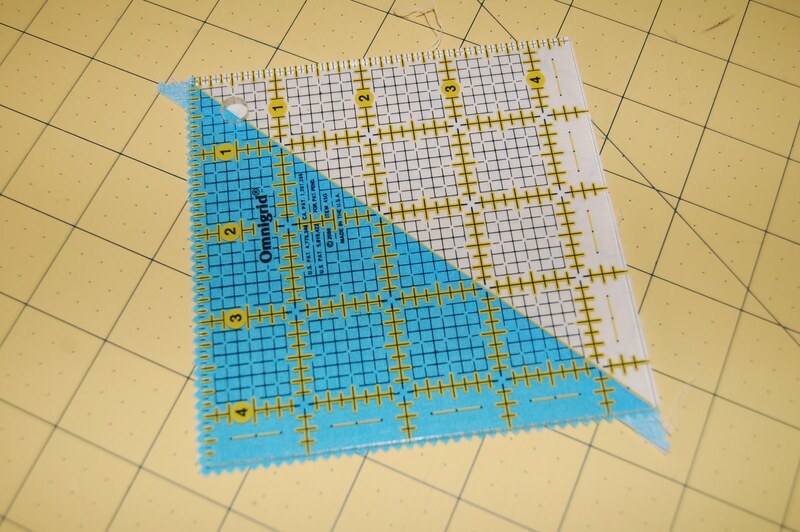 Because the bias edges of the setting triangle are exposed and we cut the strips a little longer than necessary, this needs the be measured and pinned carefully. The points of the pinwheel blocks should be 10″ apart. – Find the centre of each of your solid strips and mark, mark 10″ along in both directions until you reach the edge. Use this as a guide when pinning the solid to the pinwheel rows. – Pin, matching the pinwheel points and the marks you made. 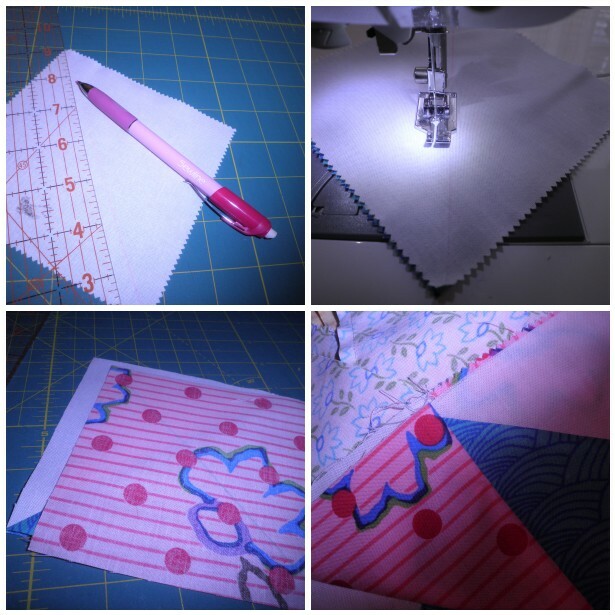 – Sew, press seam to the solid strip. 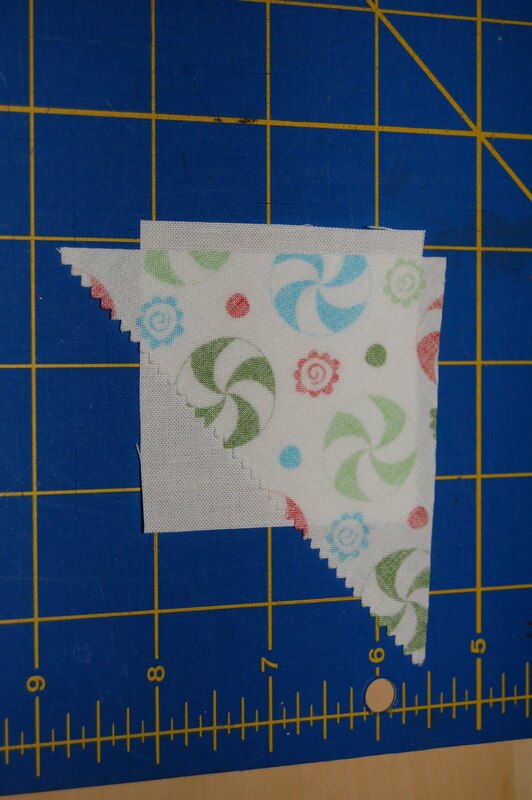 Cut off the excess strips at the side matching pinwheel points and leaving .25″ seam allowance. Either cut your backing into two and sew together to create a single fabric backing or piece the leftover layer cake sheets into the backing. Baste using your preferred method. 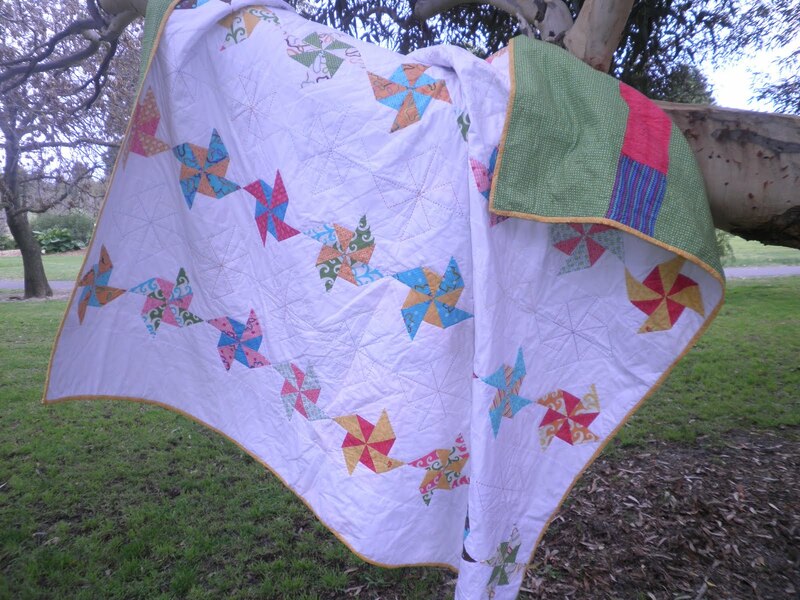 I hand quilted my Pinwheels on the Plain in No. 8 perle cotton from DMC. 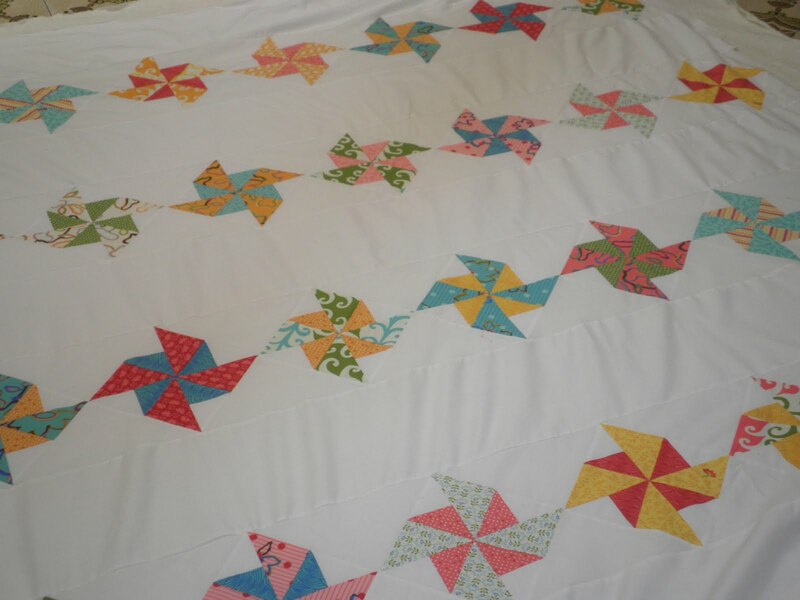 I initially outline quilted the coloured pinwheel blocks about 1/8th inch in Blanc beginning in the middle and working my way to the edges, top and bottom simultaneously. 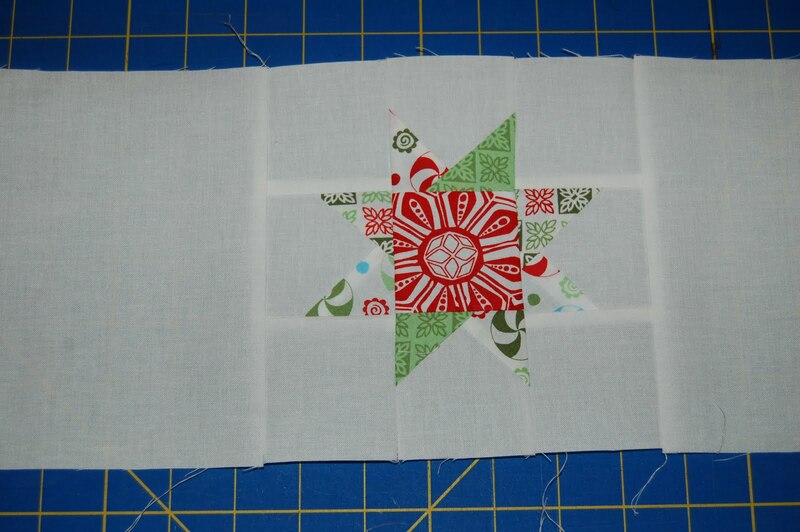 I then made a stencil and quilted pinwheels in the empty areas between the pinwheel in the middle three solid rows. 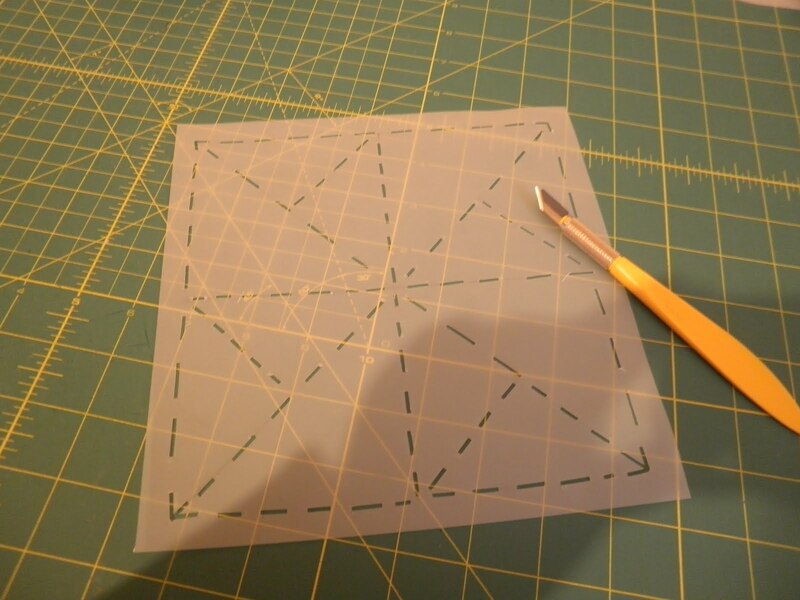 To make the stencil, I drew a 7.5″ square on template plastic and then the pinwheel shape in the centre. I cut along each of these lines using and Olfa double blade cutter in dashes. I traced this onto my quilt top using a water-soluble marker and quilted around the outside square in Blanc and the inner pinwheel triangles in two colours. I cut 2.5″ strips and machine sewed to the front and hand sewed to the back. Hi Everyone! 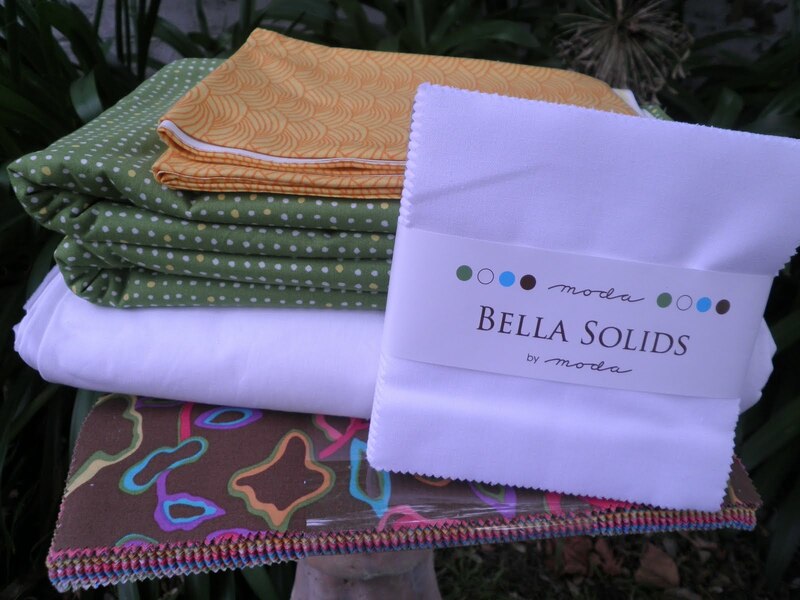 It’s Jera from www.QuiltingInTheRain.blogspot.com bringing you another MBS tutorial! 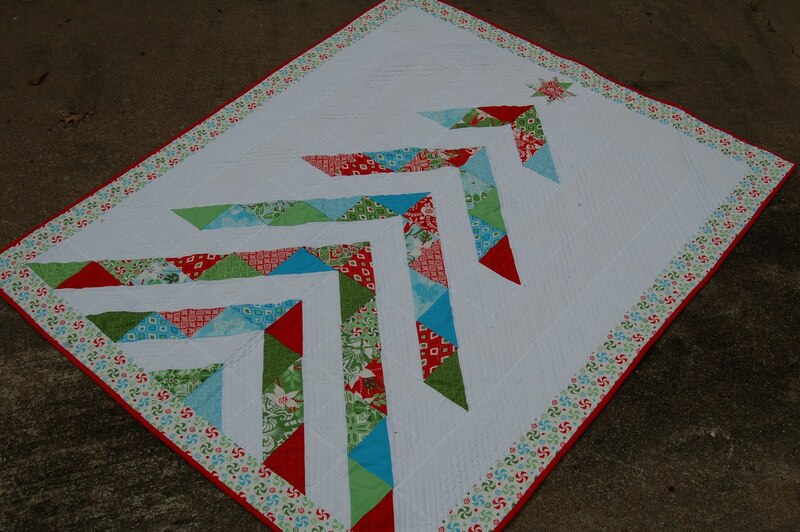 This is a simple and beautiful quilt that will make your favorite fabrics pop! 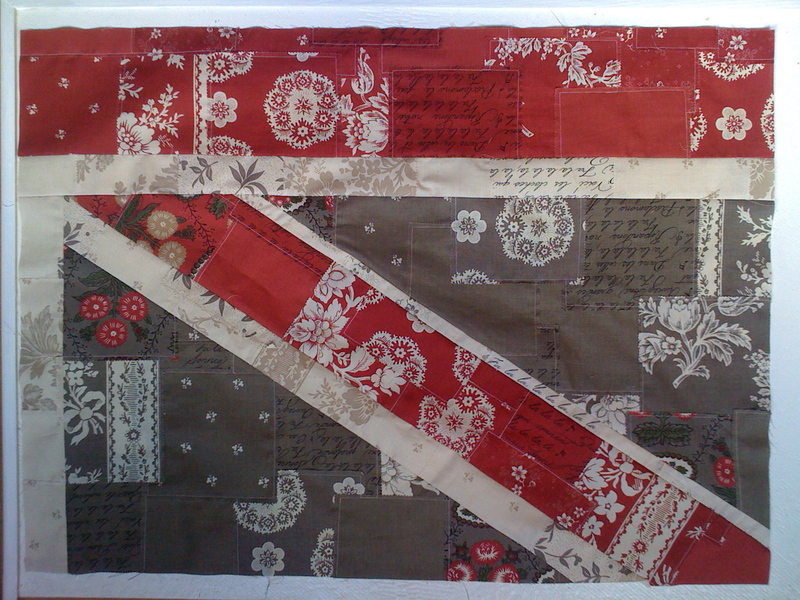 Check out my 3-step tutorial below that uses jelly roll strips to make the entire quilt top. I used the Summer House collection by Lily Ashbury. 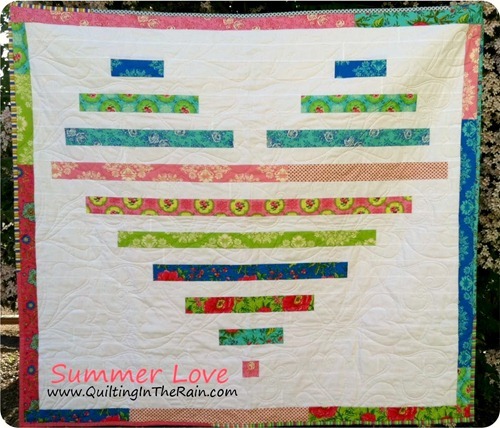 Make one yourself and checkout my blog at www.QuiltingInTheRain.blogspot.com for a chance to win a Terrain jelly roll by Kate Spain! Step 1 – Trim the strips from both the colored and solid white jelly roll to the exact measurements represented in the cutting diagram below. (Note: the measurements below are the exact cutting measurements of the unfinished pieces). 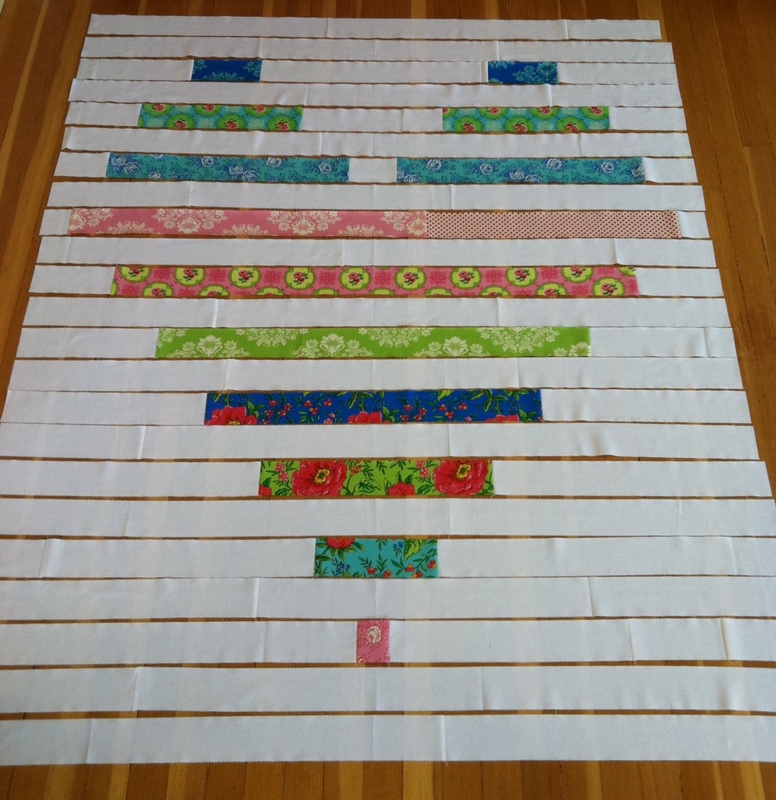 Since a jelly roll strip is 2.5″x44″ long, in some cases you will need to sew a couple strips together and then trim it to get the measurements shown below. 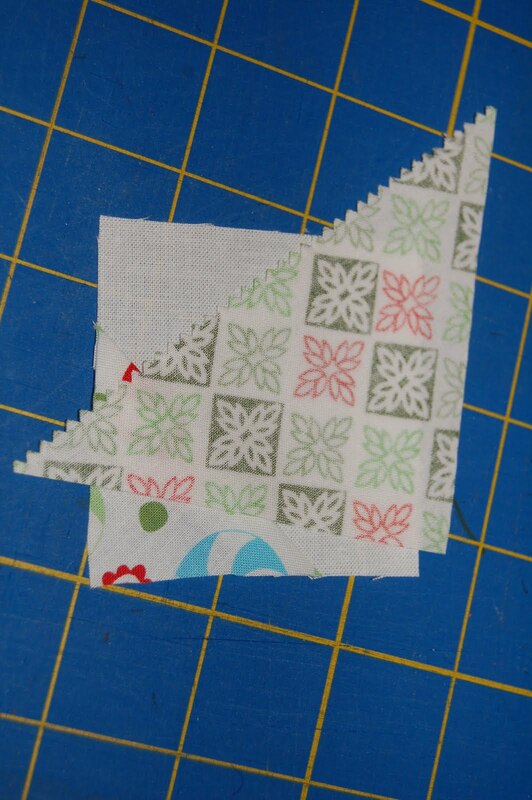 Step 2 – Using a 1/4″ seam allowance, sew all the pieces in each row together, and then sew all rows together. Left and right borders – 46.5″ long. Sew these on first. Top and bottom borders – 57″ long. Sew together six leftover strips to create the binding. A binding tutorial can be found here. Hi! I am Lynne from Lily’s Quilts. 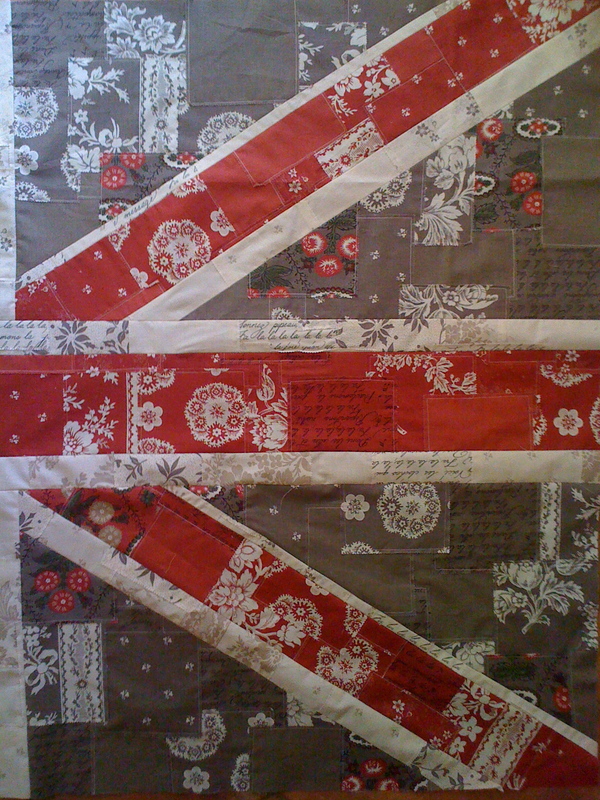 As you might guess from this tutorial and from the abundance of union jacks on my blog and in my Flickr photostream, I am from the UK. 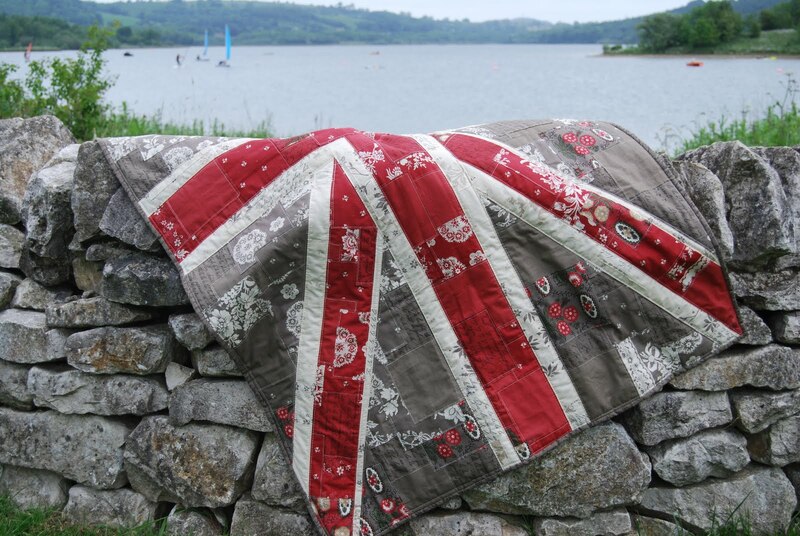 In this tutorial, I will show you how to make a shabby chic union jack wall hanging from charm squares from the French General Fa La La line. Although this is a Christmas line, the use of the brown, red and cream charms from this line means you will be able to leave the wall hanging up all year round. 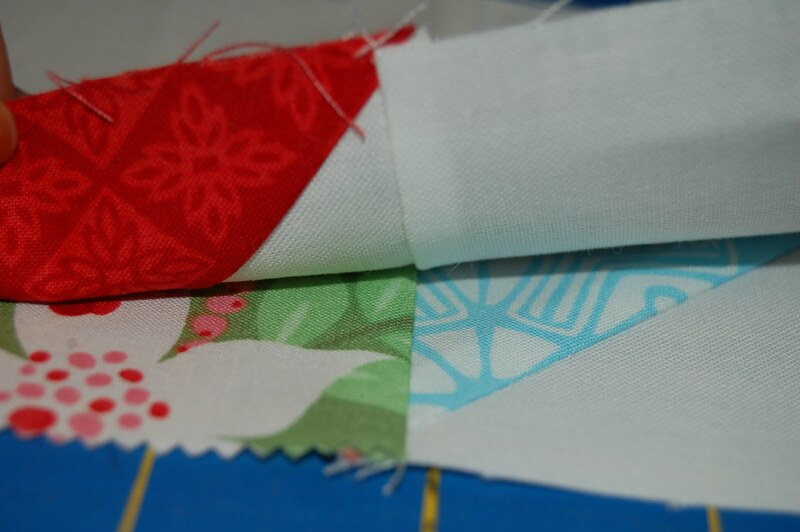 In this tutorial, I am first making shabby chic fabric from charm squares in three different colours – red for the main stripes, brown for the background triangles and cream for the skinny stripes. You could use other charm packs, grouping the colours into three groups or perhaps into warm colours, cool colours and neutrals. You could also make this wall hanging with a layer cake cut into charm squares using a pinking rotary blade cutter. 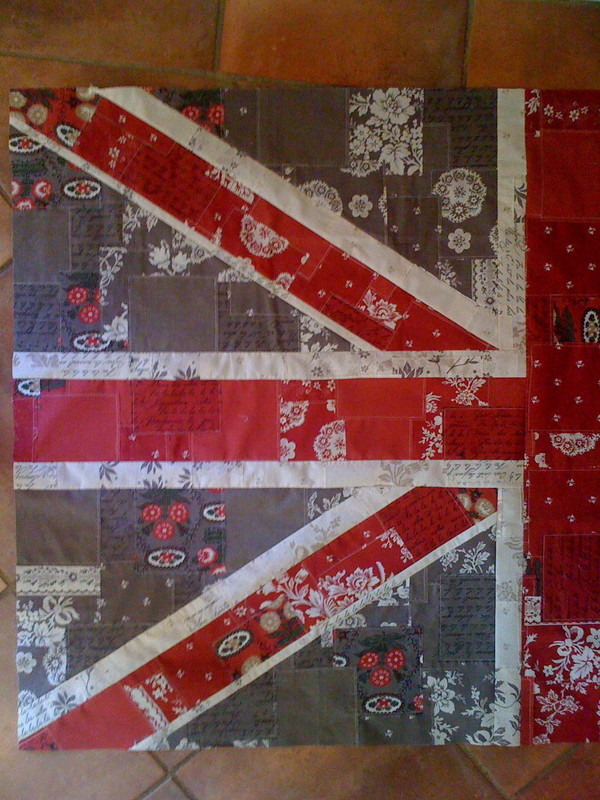 I used 8 charm packs for this wall hanging because I wanted to stick with the brown, red and cream colours for the flag and will use the leftover charm squares for another project which I will be showing you later on in the year. 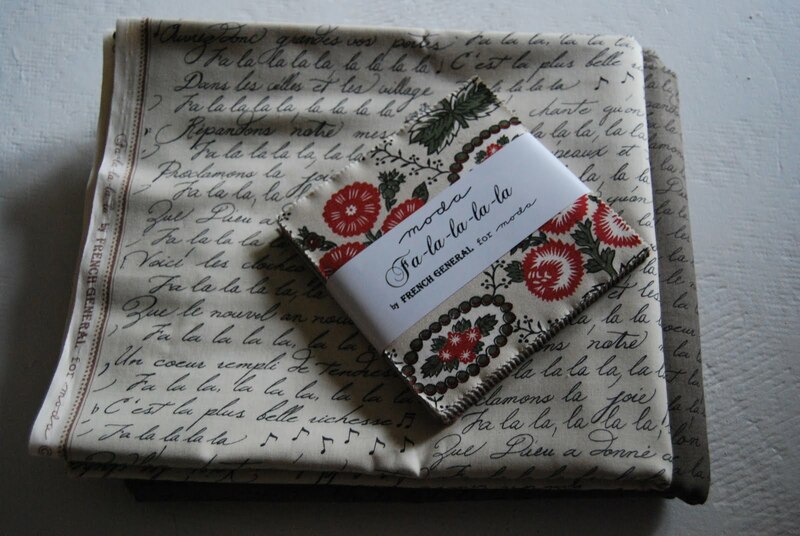 8 Fa La La charm packs (or two layer cakes cut into charm squares using a pinking rotary cutter blade). 2 1/2 yds backing fabric (the offcuts from making the backing can be used to bind the wall hanging). 1. Open up two charm packs and sort into colours: brown, red and cream with brown/beige patterns for this project and green and cream with green and red patterns for another project I will be bringing to you later on in the year. 2. 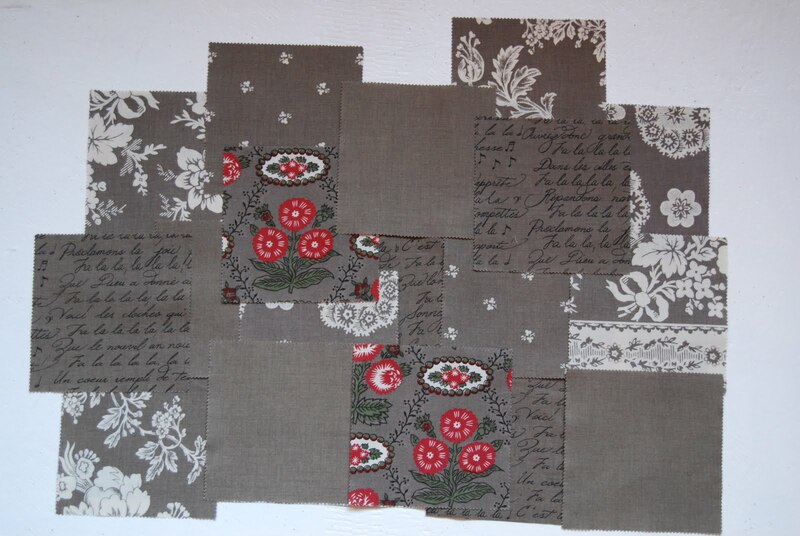 Cut four pieces of newspaper 13″ X 20″ which you will use as the foundation for making the shabby chic fabric. 3. 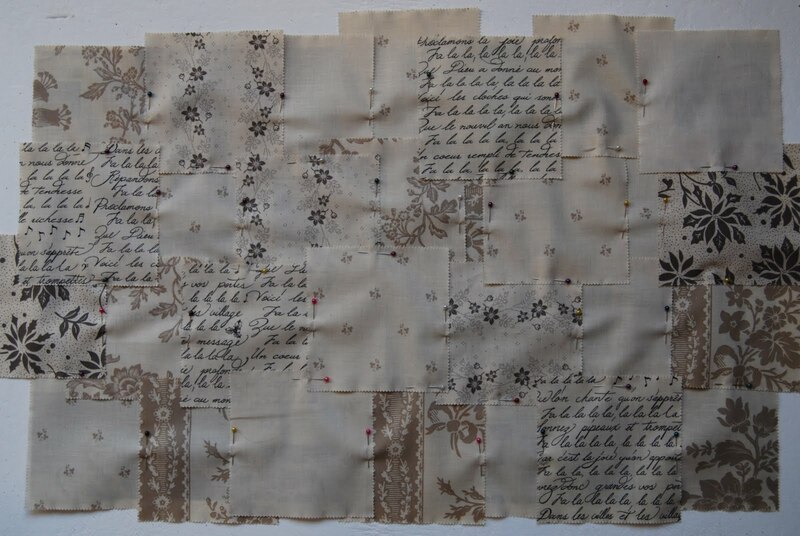 Start by taking 16 brown charm squares and laying them on the newspaper in a random order until all the paper is covered. If necessary, cut one or two charm squares in half to cover the small gaps, making sure that only the pinked edges are showing. 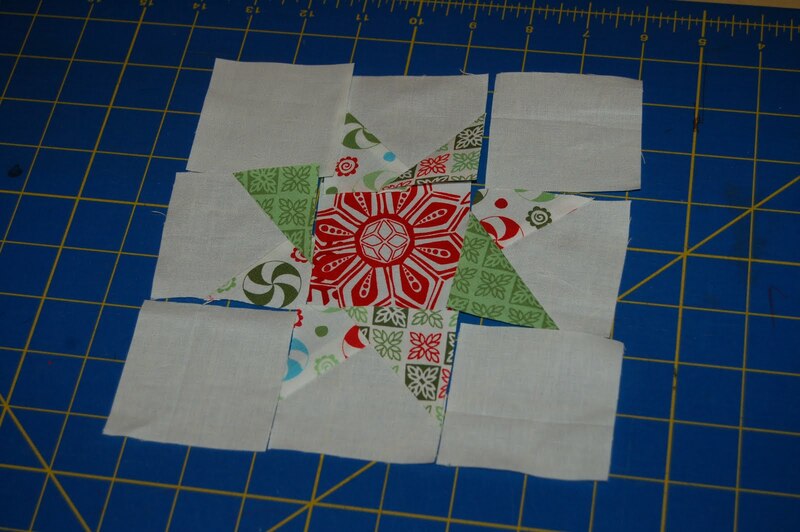 Make sure the overlap of one charm square to the next is at least 1/4″ and ideally closer to 1/2″. 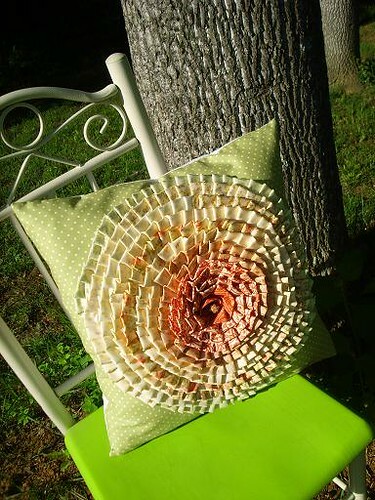 The brown squares need only reach the edges of the newspaper – they do not need to overhang them for a seam allowance – that is calculated into the size of the newspaper. 4. Pin all squares in place. 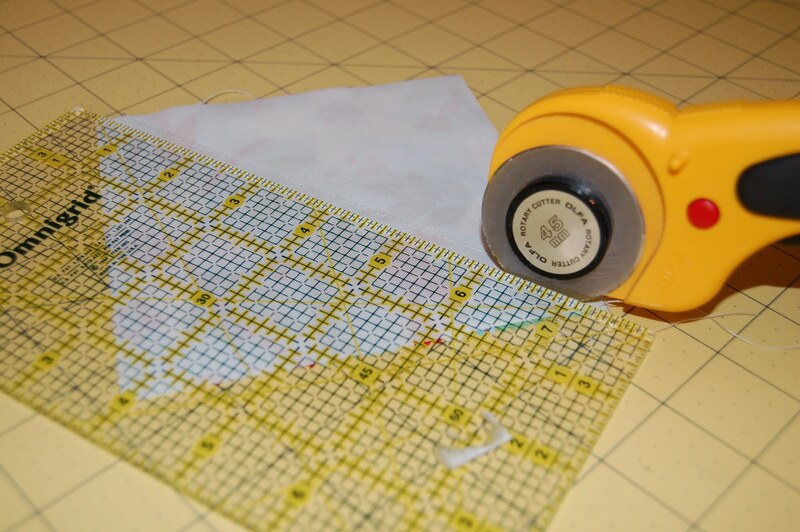 Shorten your stitch length to somewhere between 1.5 and 2 to ensure that the sewn edges hold when cut and to help making perforations in the newspaper for tearing away later. 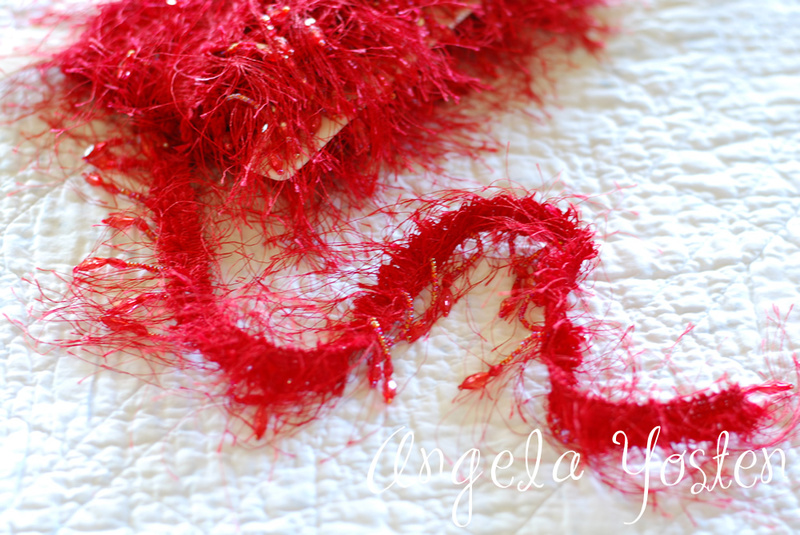 Sew about 1/8″ from the edge of each pinked edge. 5. 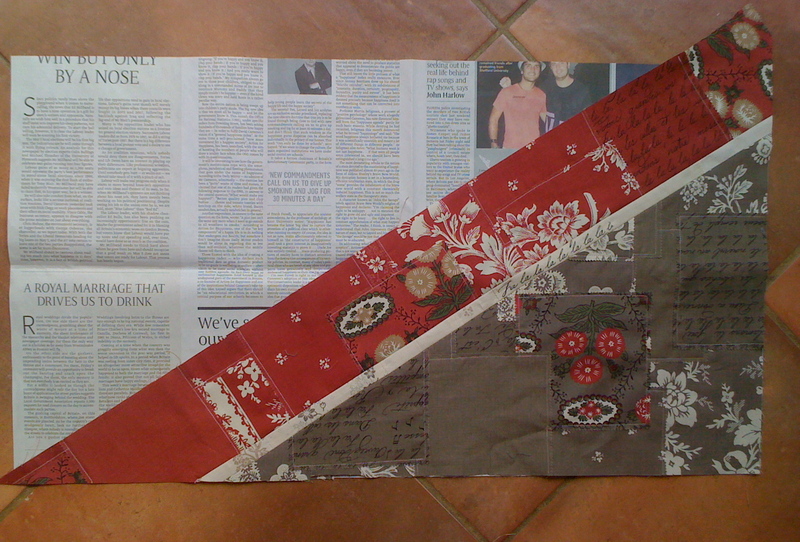 Press and then trim fabric to the edges of the newspaper then tear off all the newspaper. 6. Repeat for the remaining three brown rectangles. 7. IMPORTANT: read instructions carefully before cutting. You need to ensure that you do not cut four identical triangles. Cut two of the brown rectangles into two triangles cutting along the diagonal from top left to bottom right and two from top right to bottom left. 8. Cut one piece of newspaper 32″ X 16″ and another piece of newspaper 28″ X 20″. 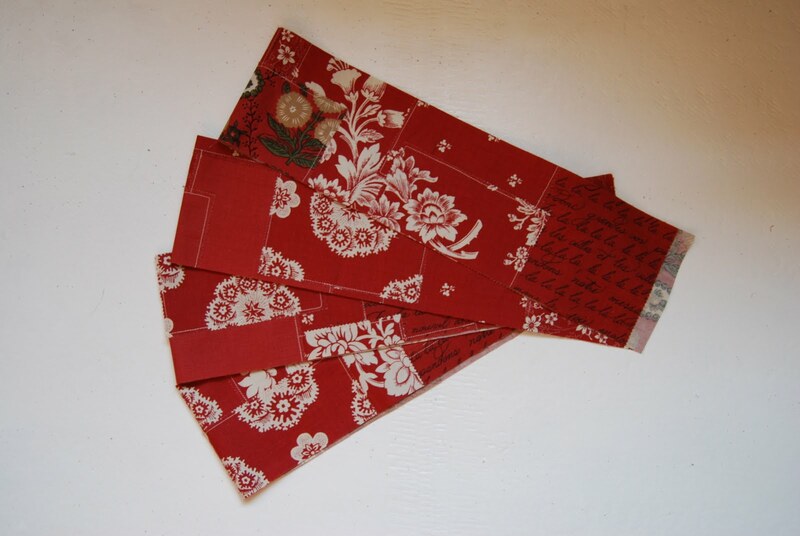 Cover these pieces of newspaper with red charm squares. 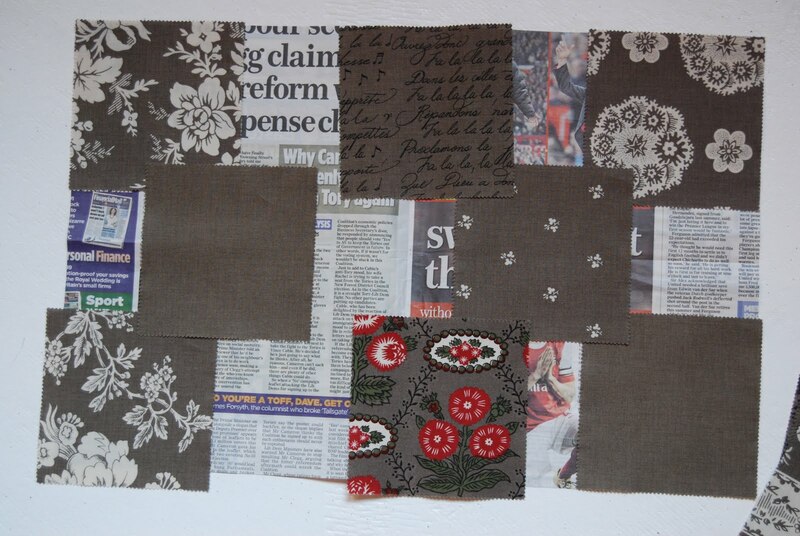 Pin, sew, remove the newspaper, press and trim as you did with the brown rectangles. 9. 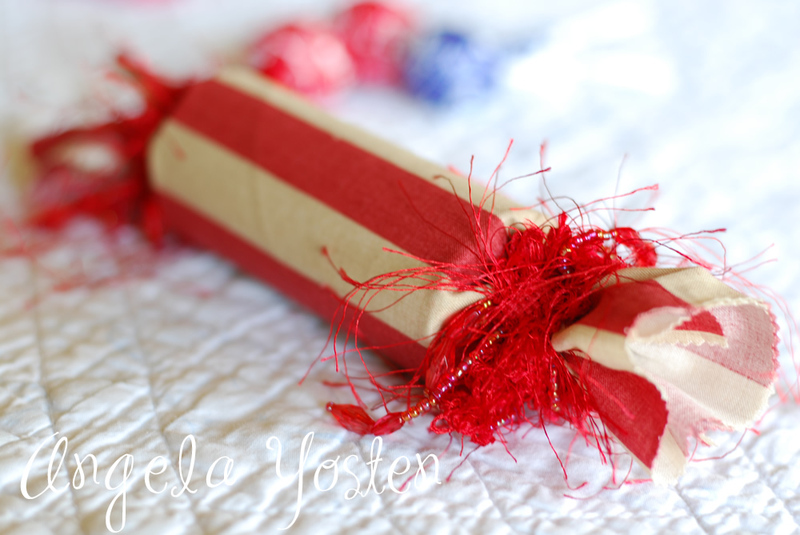 Cut the 32″ X 16″ piece of shabby chic fabric into four 32″ X 4″ strips to make the slimmer diagonal red stripes. 10. Cut the 28″ X 20″ into four 28″ X 5″ strips to make the wider vertical and horizontal red stripes. 11. 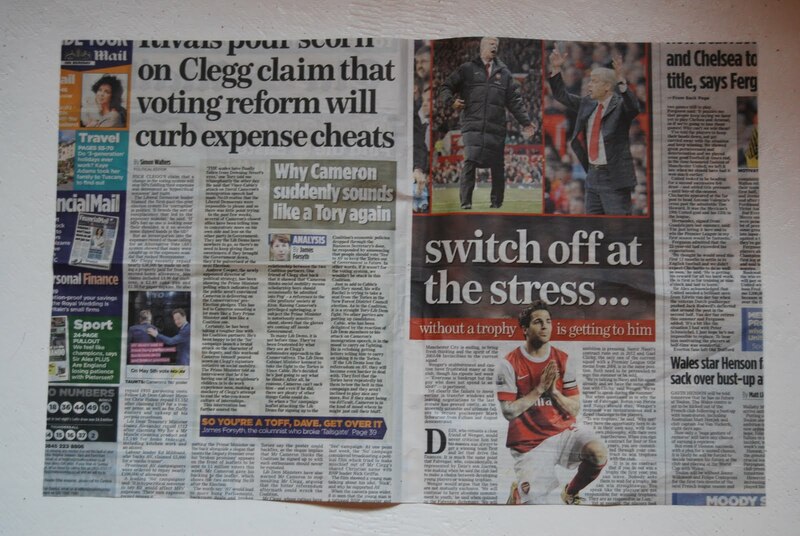 Cut a piece of newspaper 30″ X 24″. 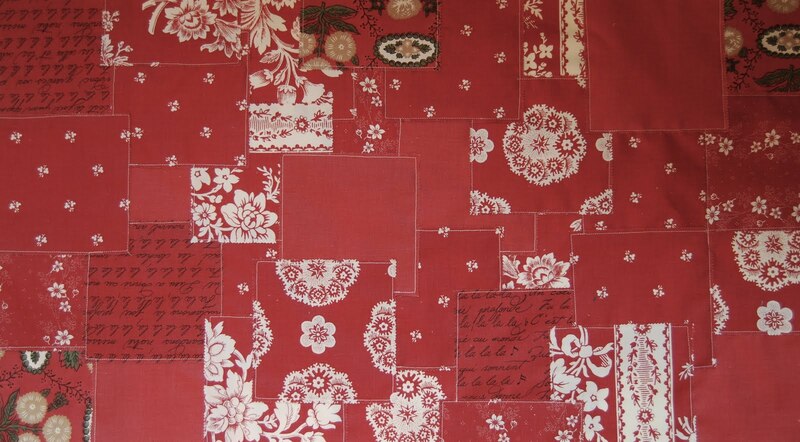 Cover it with cream charm squares in the same way as with the brown and red charm squares. 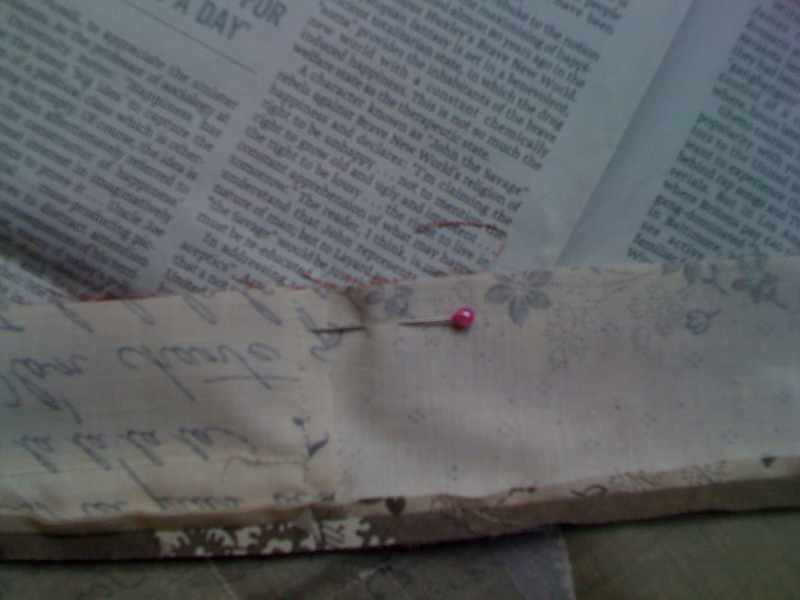 Pin, sew, remove newspaper, press and trim. Cut the 30″ X 24″ fabric into four 30″ X 1″ strips and ten 30″ X 2″ strips. 12. 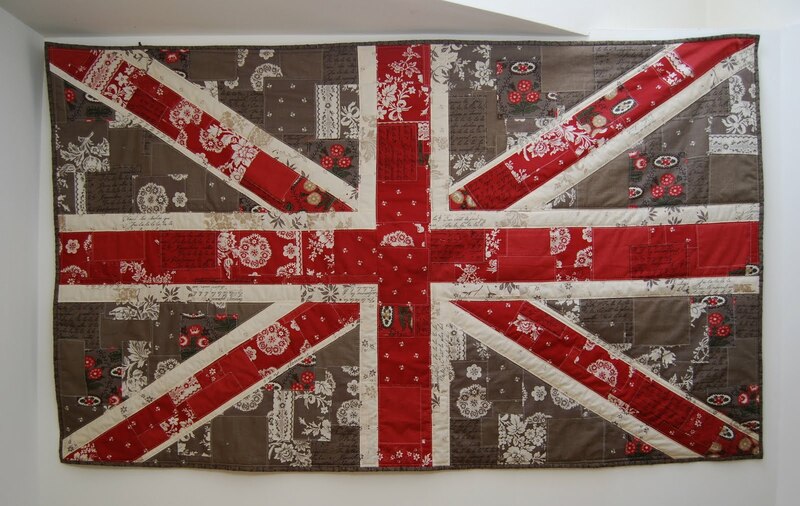 Put the brown triangles into pairs and note on each one whether a wider 2″ cream strip will be sewn to it or a thinner 1″ cream strip as per the picture of the finished flag. 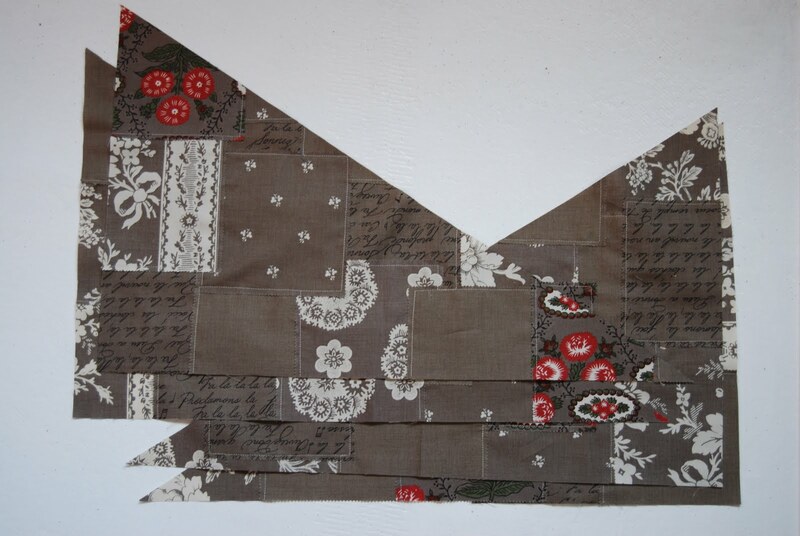 Sew 1″ and 2″ cream strips along the diagonal edge of each brown triangle. Press seams open and trim following the lines of the triangle. 13. 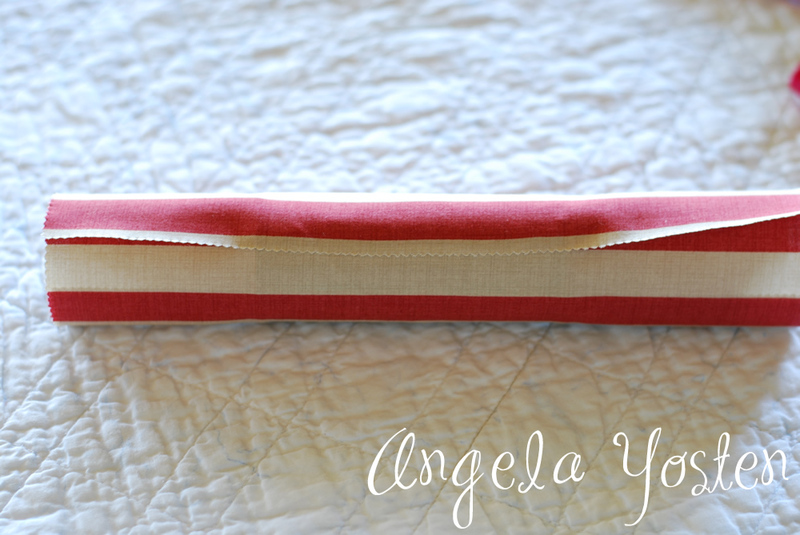 Sew a 4″ red stripe along each 1″ cream strip, taking care to ensure that spare fabric hangs off at each end. Press seams open and trim following the lines of the triangle. 14. 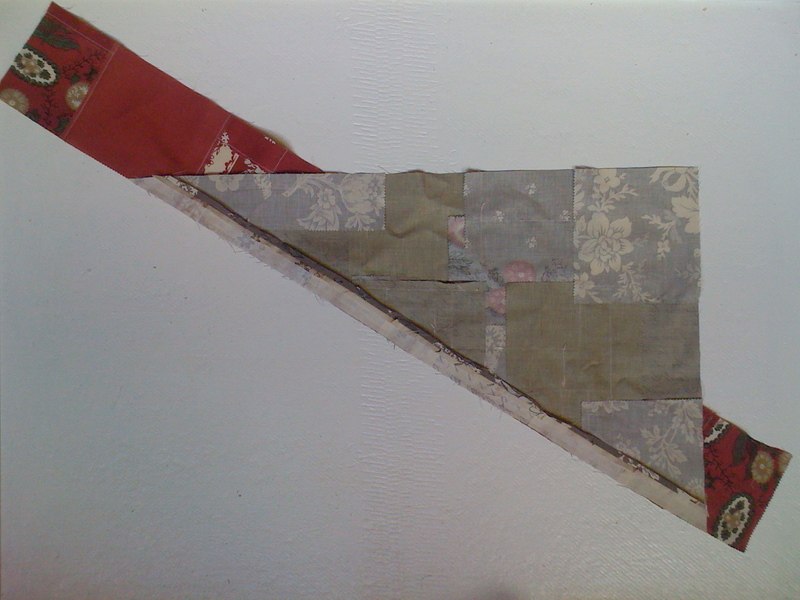 Cut a piece of newspaper 27″ X 15″ and lay a matching pair of brown triangles on it. 15. With two pins or a fabric pen or pencil, mark any point on the red stripe and the cream strip where these two meet, flip and pin the two together at this point. 16. Pin the rest of the seam and sew then press seams open and trim. 17. Repeat for the remaining three pairs of brown triangles. 18. Keeping track of where each of the corner sections will go, sew 1″ cream strips to the bottom of the top corner sections and the top of the bottom corner sections, press seams open and trim. Then sew 1″ cream strips to the right of the left corner sections and to the left of the right corner sections, press seams open and trim. 19. 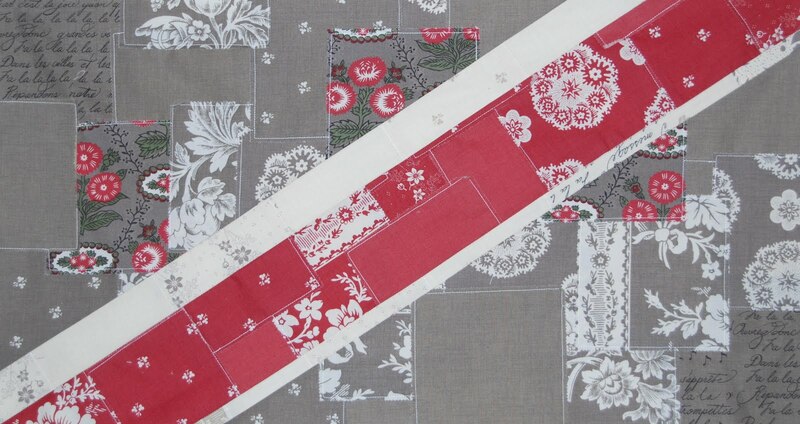 Sew wide red 5″ strips to the top of the bottom two corner sections, press seams open and trim. 20. Sew those sections to the top two corner sections, press seams open and trim. 21. 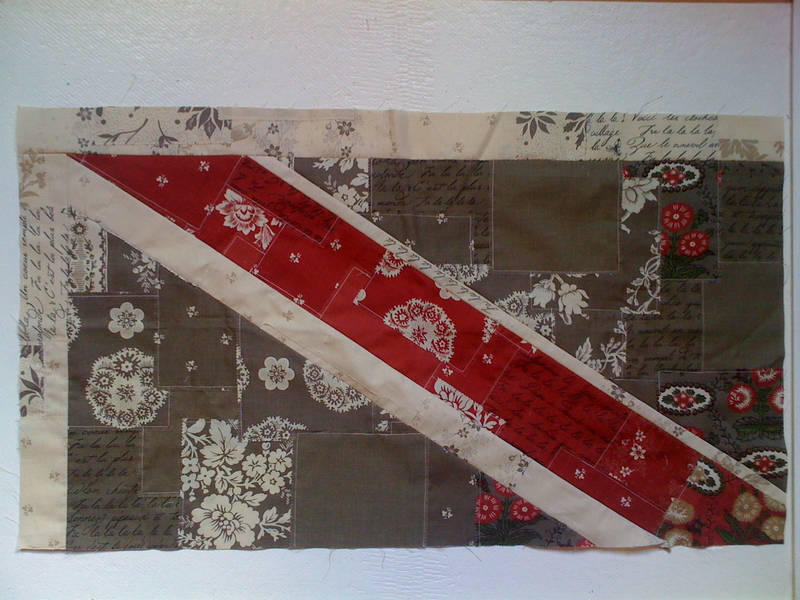 Join the two remaining red 28″ X 5″ strips end to end by overlapping one pinked edge over the end of the other and sew along the pinked edge in the same way as when making the shabby chic fabric. 22. 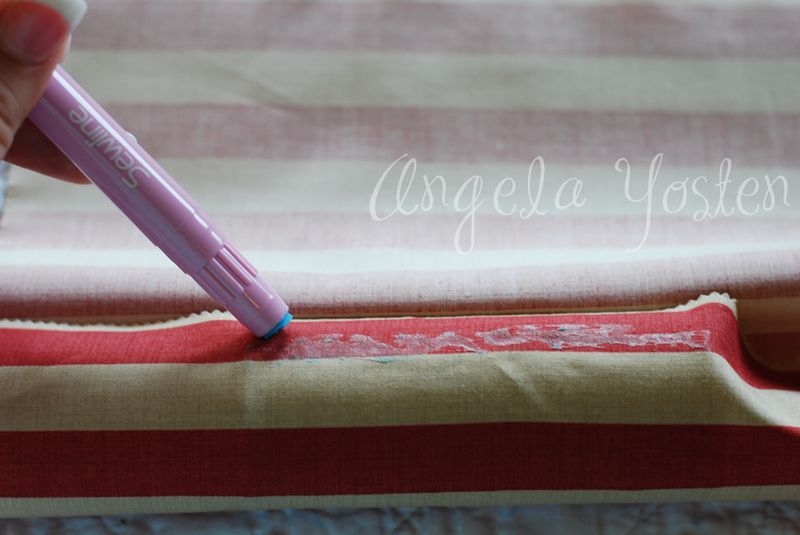 Sew the long red strip to the right side of the left flag section. 23. Now take care over this step – if you align this perfectly, the finished wall hanging will look so much better than if you slightly miss. Line a ruler against the edges of the cream strips and mark the point where they would reach on the edge of the wide red strips. Pin and sew just the middle section of this seam to start with. 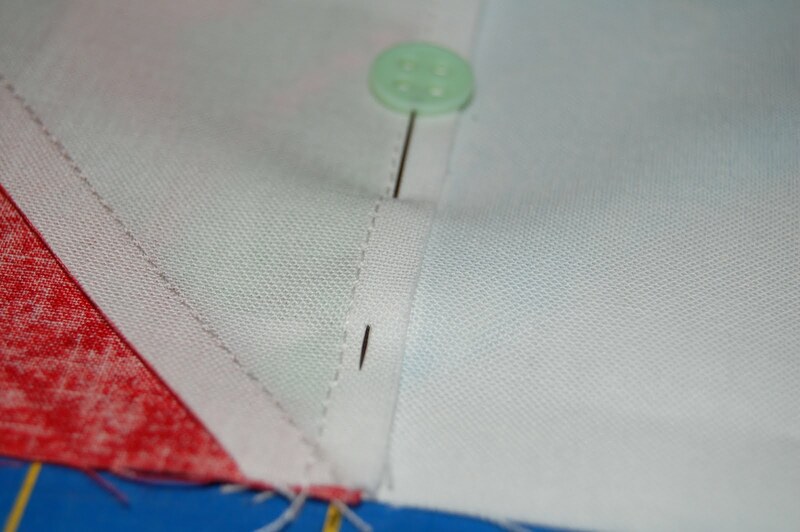 Flip and make sure you have the flag lined up perfectly before sewing the whole seam. Voila, you have your finished quilt top. 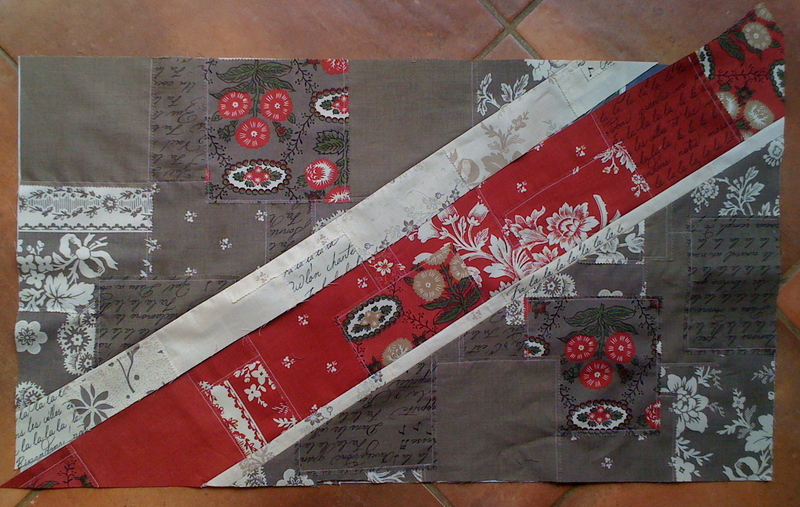 Quilt as desired, bind and hang up. If you make one of these wall hangings, please come and share your pictures of it in my Flickr group. 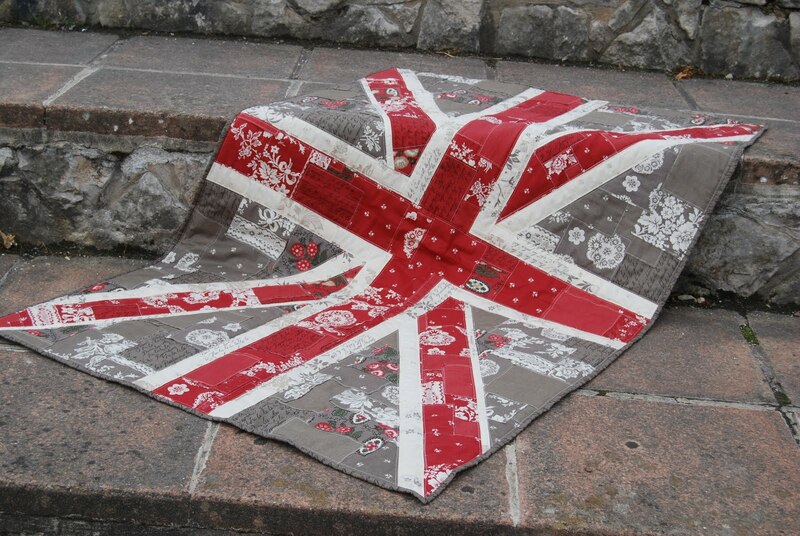 One 36″ X 60″ Shabby Chic Union Jack Wall Hanging.